As a follow-up to my post on understanding satellite pings, I thought it would be helpful to give a bit more detail on how the location of a ping can be identified. In my previous post I indicated that you could potentially measure range (based on timing) or angle (based on power). After some further thought, it is likely that the range measurement would be much more accurate, not least because a change in angle (e.g. a plane banking) would throw off the power measurement significantly. The determination of a “measurable distance” is also what David Coiley of Inmarsat described in an interview with the New York Times last week. How does this measurement happen, and how accurate is it? The first thing to understand is that the pings are sent to the satellite in a specific “time slot”, which has a given frequency and start time, but the burst of energy in the signal might not always be exactly in the center of the slot. This is illustrated very well in a recent Inmarsat patent, which shows the variation between three different bursts B1 to B3 which are scheduled in the same frequency (f1) and successive time slots (T1-T3). How much the burst is offset in time relative to the center of its designated timeslot gives a measurement of range, since the further the terminal is away, the longer the energy will take to reach the satellite. How much the burst is offset in frequency relative to the center of its designated timeslot gives a measurement of speed, since if the terminal is traveling towards the satellite, the frequency will get higher and if it is traveling away from the satellite, the frequency will get lower (this frequency offset is the Doppler effect). So in the illustration above, B2 is shifted both in time (range) and frequency (speed), whereas B3 is shifted in frequency (speed) but not in time (range). UPDATE: One complicating factor is that if the Doppler correction takes place only in the terminal itself, then it is possible that the network may not see much if any frequency shift for the ping that is returned from the terminal. I am trying to confirm how this aspect is handled. I should also note that it would not necessarily be expected to be standard operating procedures for a satellite operator like Inmarsat to save the precise time/frequency offset associated with each burst received by its satellites. But since the precise time data appears to have been used in the range calculation, it seems logical to conclude that this information (and potentially the associated frequency offsets as well if these are available, although this was not mentioned in a CNN interview today) must have been recorded. Key point 1: It is likely to be feasible to calculate the range and possibly also the speed relative to the satellite from the ping information via the time/frequency offset method described above. What we’ve seen in terms of the arcs of possible locations so far just represent the range component of this measurement. It seems that there is no triangulation involved (which is consistent with the CNN interview), because in this particular coverage region the specific frequencies involved are only used on the Inmarsat 3F1 satellite and not on any other satellites. Its much harder to interpret the speed component (if it is available), because it is the speed relative to the satellite. So if the terminal was moving along one of these arcs, it would not be getting closer to or further away from the satellite and there would be no frequency shift. So in that situation the signal would look the same as from a plane that was stationary on the ground at the time of the transmission. If this information is actually available would expect Inmarsat to have been able to interpret the frequency shift as well as the time shift, but even then there would be no easy way to illustrate “relative speed” on a chart like the one given above. Key point 2: Speed relative to the satellite is not the same as absolute speed, so (even if this information were available) it would not be possible to determine with certainty if the plane was on the ground and stopped. Similarly, comparable data has not been released for previous “pings” before the last one. Whether or not the frequency/speed data is available, I would expect that it should be possible to determine that some points on the arcs above are more likely than others, but even with both pieces of information it is unlikely to eliminate any points completely unless other information is known (or assumed). For example, if one assumed that the plane flew at a constant speed and bearing then it would be possible to narrow down the locations quite significantly (because the speed and range would change in a predictable way, although north/south ambiguity would remain). However, that may or may not have been the case. UPDATE: Similarly, one could test the theory about “following another aircraft” because the track of the other aircraft is known and its position would have to coincide with the arcs calculated for intermediate pings while this “following” was in progress. Key point 3: The combined information from multiple pings would potentially be fairly dispositive as to whether the plane flew at a constant speed and bearing (i.e. on autopilot), although there might still be some uncertainty in the ultimate location (and north/south ambiguity) unless speed information was also available. The intermediate pings would also determine whether the “following another aircraft” theory is feasible. So now for the big question, how accurate is the location of this arc. Without the ability to triangulate between multiple satellites, then geolocation accuracy (i.e. the ability to identify where on Earth a signal is being transmitted from) is considerably reduced, but a single satellite geolocation detector from Glowlink is said to have an accuracy of 40-60 miles. However, that detector may use more measurements (of a static source) than is possible with this limited number of pings from a terminal that is moving around. So I would expect my initial estimate of say 100 miles is still fairly reasonable. Its also important to remember that the plane could have had enough fuel onboard to have flown as much as a couple of hundred miles after the last ping. Key point 4: The range accuracy is unlikely to be much better than 100 miles, and perhaps more because the plane could have continued flying after the last ping. UPDATE: This is the latest search area, as shown by Reuters Aerospace News, including up to 59 minutes of potential travel after the final ping (i.e. the full period before the next hourly ping, regardless of remaining fuel). UPDATE (Mar18): The Australian Maritime Safety Authority has held a press briefing today at which they described exactly the procedure outlined above for the southern route, i.e. assuming a constant speed and heading and correlating the results from all of the pings. They have produced the following map based on NTSB analysis showing that there only two paths consistent with the set of arcs and a constant speed/heading assumption. They declined to speculate on the northern route but indicated in the press briefing that similar analysis had been conducted. Presumably therefore it is now known whether or not the “following another aircraft” theory is feasible. 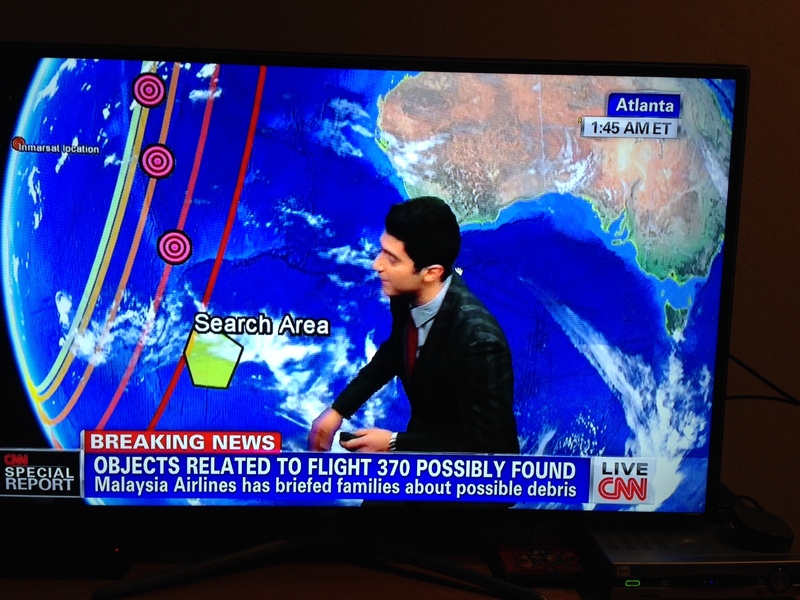 UPDATE (Mar 19/20): This evening, CNN put the image below on screen, showing purported ping arcs and the overlap with one of the projected southern tracks. It is not known if these are accurate locations, or if the image was purely illustrative. However, if the arcs are accurate, then (if the debris is a false lead) the “shadowing” hypothesis can be ruled out because the plane would not have gone far enough out into the Bay of Bengal. Moreover, if the plane is found in the southern search area having traveled along one of the projected paths, then it was flying in a straight line at constant speed (as AMSA and NTSB previously assumed in making these projections) and so was not likely to have been under active pilot control when it crashed. In addition, if the plane is found in the identified search area so quickly, it will intensify the scrutiny of the delays in making use of the ping information which Inmarsat provided very early in the investigation. UPDATE (Mar 20): As noted by a commenter, the Washington Post published 3 of the earlier ping arcs in a graphic shown below. These are quite similar to the ping arcs depicted by CNN, suggesting that if the 4.11am ping arc is as close to the 5.11am arc as suggested by the CNN graphic, the “shadowing” hypothesis for the northern route is likely to be infeasible. If the arcs for the other pings were given, under what conditions would two of them exactly overlap one on top of the other? That would only happen if the aircraft either maintained or regained the same angular position relative to the satellite (which is geostationary). It could do this in flight, but more probable would be that it maintained the same angular position by virtue of being being stationary, and still intact. Why have they not divulged the preceding arcs? Possibly the last wo of them are overlapping? Possibly they know therefore that it landed intact? They must have some reason to withhold the preceding arcs? If the arcs for earlier pings showed an irregular movement (or none whatsoever), and were therefore inconsistent with straight and level flight, then that would be a significant issue for the “autopilot” theory. That could potentially be seen even without any information on “relative speed”. Thanks for the great description of the ping protocol for the inmarsat – ACARS system. re: accuracy of the ranging based on ping response time. My back-of-the-envelope calculations (assume earth is a sphere, speed of light, constant delay in terminal, no Doppler effect correction required) is that with a 1 millisecond (ms) resolution on the satellite, the round trip time would be accurate to within 150 km and this would translate to ~1 degree of arc on the earth’s surface as long as MH370 was between 70 and 40 degrees relative latitude (where 90 degrees relative latitude is directly under the inmarsat). For scale and context, 1 degree at the earth’s surface (not much different at 32,000 ft altitude) is approx 112 km of arc length and 1 degree of relative latitude between 70 and 40 degrees is > 150 km of distance from the satellite at 35,800 km ASL (which equates to the distance traveled in 1 ms (round trip time) at the speed of light i.e. from satellite to terminal and back). I too am eager to see what the other ping arcs will show and see if these ping arcs relate to the theory that MH370 was shadowing SIA28 (Singapore to Barcelona) for some of the flight time. Not sure of accuracy that can be determined in arc selection …. several posts are attempting to address that! From past images, I have assumed the arcs can be resolved to 5 deg …. I see arcs drawn every 5 deg, ie: 40deg, 45deg, 50deg, etc. I modeled one hypothetical straight line path from the straights of Malacca to southern Kazakhstan & with these 5 deg seperated arc’s, came up with each hourly ping giving 50deg, 55deg, 55deg, 50deg, 45deg, 40deg. So in this example, arc repetition is possible on a straight line path. Clearly resolution is an issue. Lack of earlier ping data is infuriating to say the least. If two arcs that were 1 hour apart in timing and were physically separated by a distance equal to the planes 1 hour maximum range then you would be able to infer with certainty that at that point the plane was headed either directly towards or away from the satellite position, depending on the arc positions. This information would give some clues on possible final destinations and ultimate lengths of the final arc. was your post in response to mine? If so, I made a typo and should written that 150 km delta height is 2 degrees of relative latitude. My assumptions were based on a 1 millisecond resolution in ping response time. That assumption and the speed of light gives 150 km of distance from the satellite (same relative position above the earth at all times since geosynchronous orbit – GSO) since the round trip time for light to travel 150 km to a receiver/reflector is 1ms. I then provided context (and should have caught my typo) by pointing out that 1 degree of relative latitude (where the point on the earth’s surface directly under the inmarsat is defined as the pole) is the equivalent of approximately 112 km which would not provide enough additional distance to resolve a new satellite-distance arc since the vertical distance would be less than 150 km. Note too that the measurement of 2 degrees of “relative latitude” only provides enough vertical delta distance if the rel lat is <70 degrees (with 90 deg being the pole discussed earlier). If MH370 was moving radially away from the pole, then we would expect to see a new arc roughly 8 degrees greater or less than the previous arc (900 kph / 112 km per degree of rel lat). If (as looks to be more likely) MH370 was travelling along the 45 degree arc, we would not see the periodic arcs being much different than the final arc with a resolution of 2 degrees being the finest resolution possible. Given the limited data at our disposal, can we eliminate any parts of the currently suggested arcs? Another question, if the plane was flown towards Langkawi island as has been suggested, and then turned south, to make its approach (possibly flown on a course set by the pilots early on during some sort of emergency), but the pilots were not in a position to subsequently make the landing, how would this affect the ping times? I presume if we had all of the data, it would be possible to factor this in to narrow down the likely location in the southern zone in this scenario. It is my understanding that the Malaysian military radar show first the turn to the West followed by two course corrections to the north before radar contact was lost. I am not suggesting we rule out any parts of the current arcs but if we had the prior arc information (rather than just the final arc position at around 40 degrees relative latitude) we would have the ability to narrow the search patterns to the most likely areas. As with any search, you begin the search in the areas that have the highest probability of containing the target but then you widen the net (so to speak) if you do not find the target in the first area. With this search, we the public have very little information but there seems to be enough information that does exist (but is not yet public) to eliminate or support several hypotheses. 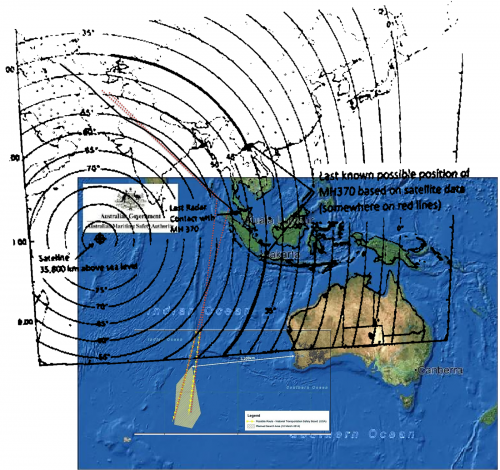 Consider the hypothesis that the plane remained on autopilot for 5.5 hours after last radar contact due to pilot attempting to reach the alternate landing site in Langkawi after an in-flight emergency (the “Goodfellow hypothesis”), we would see the satellite ping “track” either: a) decreasing; b) increasing; or c) maintaining relative latitude. If on the other hand we measured the relative latitude zigzagging then we could deduce that the plane was not on autopilot (NB that there are possible conditions that would explain an autopilot course that decreased then increased but a zigzag course greater than the inherent noise in the signal would be highly unlikely). Consider the shadowing SIA28 hypothesis (the “Ledgerwood hypothesis”). We should compare the Inmarsat ping track of SIA28 and the ping track of MH370 to see if they overlap. If they are vastly different (other than at the final ping) then this hypothesis would be disproved. I don’t think any initial evidence will be conclusive but certain theories can be disproved with the available (but not yet public) information. I can only hope that the analysts working on this search are testing these (and other) possible theories. As noted in my latest update above, the Australians and the NTSB have conducted the southern route analysis to narrow the search area in the Southern Ocean. Now we need to find out about the shadowing hypothesis. Excellent. Thanks for the update. I am on pins and needles for the northern route analysis although there are incredibly challenging political implications for that potential route and any public dissemination of information will likely be sparse and tightly controlled. I can understand why the AMSA had no push-back on releasing their new information (no sovereign entity in the vicinity). Should’nt the Northern narrowed search area be exactly as the southern, just mirrored? If you assumed that the plane was flying straight at constant speed then you could perform the same analysis for the northern search area. However, that assumption may not be valid for the northern area. In addition, the map would not be entirely symmetric because the plane did not start on the equator. But I’m guessing that the tracks shown by Australia would potentially be sufficient to enable someone to now back calculate the arcs associated with each ping, assuming a uniform time interval. The AMSA/NTSB analysis included ocean currents, wind patterns at the time and “certain assumptions” to calculate the area of highest probability for the search. The northern area arcs (yellow arrow arced lines in the AMSA youtube charts) will be very similar but the northern search area will be different because: a) there are no ocean currents in the most likely area in the northern search area; b) the wind patterns at the time would have been different (post last ping); and c) presumably the “certain assumptions” would be different given the other available information (i.e. primary military and civilian radar). I agree with @timfarrar that someone (not me) could back calculate the arcs for the northern area. I find it strange that the charts shown/released by AMSA/NTSB only show two arcs and they seem to intersect above the top of the chart – more specifically, I suspect if the two arcs show the potential arcs for the last two pings, showing more would cause a lot of questions about the northern route. I don’t know what projection is used in the chart but I assume it is Mercator so on a typical world map, the actual arcs would look slightly different in the south than in the north. re: error in position after last ping: Looking at regulations for commercial aviation regarding reserve fuel requirements (this is a historical reference and I don’t know if the modern requirements have changed dramatically – look for international flight reserve fuel requirements – see ), the craft would have to have 10% + 45 minutes + 200 km to alternate airport + climb-out and 2nd descend. From my calculations, (I took two approaches – one for max range and the other for max endurance = ~80% power of max range) 7.5 hours of total flying time is VERY close to the maximum range time in the air (my calcs are imprecise but suggest 7.75 hours is a reasonable mean endurance for max range) and the last ping arc marries to that max range along several possible routes to the north. AMSA/NTSB never released more then the last arc, right? The two path they shown has to be variations depending on some asumptions, or has I missed a chart with two arcs? I am referring to @timfarrar’s Mar 18 update and the linked map. There are two yellow arcs that may be error bar-type arcs or variations as you suggest, I was trying to work out if those two arcs could conceivably be arcs from the same satellite but I don’t think they are (all arcs of specific distance from a GSO satellite would be concentric – line of intersection of a cone suspended above the equator and the globe/sphere). The chart given above has two yellow lines which are potential airplane flight tracks. They are NOT the arcs themselves. The tracks were calculated by the NTSB to be consistent with the known pings, i.e. intersecting with the arcs at the correct times, assuming a constant speed and heading. My point is that by looking at these two tracks, extending the straight lines backwards to the origin and taking equally distributed points along these tracks, it would be possible to back calculate the arcs themselves, which have not been produced publicly. The arcs can then be referenced against other hypotheses related to the possible northern route. Understood re: the track and the ping data arcs. I have been guilty of “thinking on the keyboard” a bit and not articulating myself very well. To my eye, the two possible tracks (yellow lines) from the AMSA/NTSB intersect about half way between the search area and the last point of contact on Malaysian military radar. To reach this conclusion, I have enlarged the large area map that shows the search area but does not show the two yellow lines and overlain the small area map so that the search area and Australian coast overlap then extended the yellow lines. I have also overlain the NYT’s arc picture but unfortunately it does not extend into the Southern search area so doesn’t really help me visualize the potential Northern search area. Still a mystery that the earlier ping arcs are withhold. 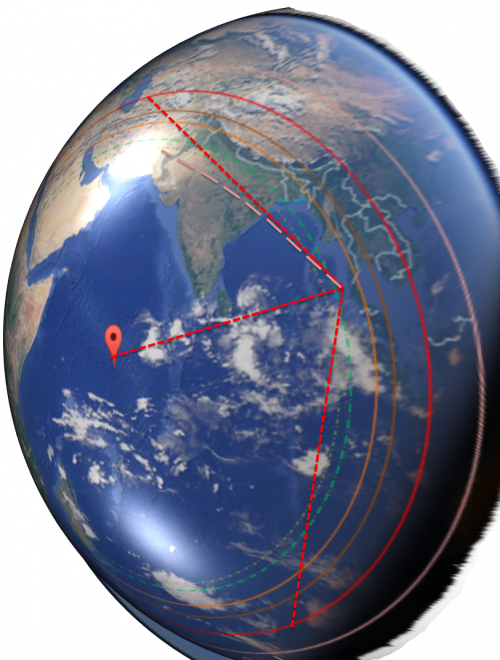 I have also created some pictures from Google earth to visualize the concentric arcs from the Inmarsat (located at 0(N), 64E) and allow better visualization of the “straight and level” flight at these scales – i.e. incorporating the curvature of the earth. I have to say that I just can’t get my head wrapped around the Southern route unless I ignore the last reported position and heading from Malaysian military radar. I know they have to pursue all possible alternatives but my curiosity is in overdrive regarding the reasons why the authorities have not released any Northern route data. Like you, I want access to the earlier ping data. I’ve read somewhere (sorry, can’t remember, will try) that probably the data necessary to calculate the angle of handshake signal from the A/C to the satellite (hence calculate an arc) is overwritten by each succeeding ping. The argument was that calculating the angle was never part of the purpose of these pings, and the calculation has been possible not by design but by ingenuity. I would be interested to read your source on the over-write of the ping response data although I can see the logic behind it given what the pings are used for and the limited storage space available on any satellite (let alone the older 3F1); however this is atypical for any terrestrial network traffic logging. I agree that it is strange (if not entirely mind-boggling) that no journalist (I counted >12,000 separate articles referenced on Google News this morning) has even asked the question. At the Australian press conference (video linked above), AMSA said they had analyzed all of the pings to come up with the two possible tracks. So the data certainly appears to exist. Note that data is logged at the network control center, as the satellite is just a bent pipe reflector – all signal processing happens on the ground, so “limited storage space” would not be an issue. I am very surprised that the conclusions about the “shadowing” hypothesis, i.e. whether or not it is viable given the ping data, have not yet been released (or leaked). The Australians indicated that the northern route analysis had been conducted but they were not willing to discuss it. I would tend to think that if the shadowing hypothesis had been disproven, the Malaysians would want to state that publicly. Thanks, the over-write hypothesis didn’t make a whole lot of sense; the bent pipe makes MUCH more sense. I feel the same way about being surprised that the shadowing hypothesis study/conclusion information has not leaked at all. It is the only one (as bizarre and improbable as it sounds) that appears to fit our current (public) data points. I would seem to me to be one of the easiest theories to refute if the data showed that it was impossible (i.e. if the arcs of the SIA68 location from 3F1 and the arcs of MH370 from 3F1 did not overlap, it would disprove the hypothesis). The fact that no leaks or even public acknowledgement (given how widely reported the Ledgerwood hypothesis has become) of this theory appear to exist has piqued my curiosity (I have setup a Google alert). Of course, lack of information is not proof. I can only imagine how excruciating the waiting for information must be for the families of the passengers and crew. In fact you don’t need any data on SQ68 from Inmarsat. Their track is publicly available from SkyVector.com and FlightRadar24.com and that is what Ledgerwood plotted. BTW It would be great to see any charts you can share. Feel free to email them to me if you can’t upload them by editing your comment. I don’t seem to have any ability to edit my past comments so I will try to post a link to my charts (note, they are not great quality as I just created them to assist my understanding of the geometry and scale) below (drop box link). re: SIA68 arcs – Sorry, I was not clear, I understand that its track is already known and thus its ping arc data is not needed. What I was trying to say above is that the SIA68 flight path would intersect (or overlap a portion of) each of the (5?) ping arcs for MH370 if the hypothesis is true (note that overlap and intersection does not prove the hypothesis but it does support it). This is your key chart. Appreciate its not 100% accurate because of potentially different projections on the earth, but it would appear that the earlier pings are between the 50 and 55 degree contour for several hours before going outside 50 degrees and towards the 40 degree contour in the last 2 hours. That is fairly consistent with the SQ68 flight path across the Bay of Bengal. So at first glance (without correlating the timings precisely), the earlier pings are not definitively inconsistent with the shadowing hypothesis. I agree about the consistency with the SIA68 path. I was really only looking at the 50 and 60 degree marks but you are right, both potential paths remain between 50 and 55 degrees which certainly supports (but does not prove) the shadowing hypothesis. From my extension lines, it looks like the two possible endpoints are very close to IGREX and GIVAL waypoints which I find interesting. If the resolution of the ping response time is 1ms then the resolution in relative latitude is <2 degrees at these relative latitudes so they should be able to narrow down the possible paths even more closely since the AMSA plots appear to suggest that the potential flight paths are quite close together. I would love to see Ledgerwood join this conversation but I don’t want to link to his Tumblr since there seems to be a lot of noise in his comment section and your comment section has a much higher signal to noise ratio. Your analysis of my combined charts and Ledgerwood’s chart is very helpful IMHO. Incidentally, I did the same plots as he did in SkyVector on Monday and should have made the next step to overlay the SIA68 known path on my synthesized chart (as you did) the fit to the publicly available data should raise plenty of eyebrows. Posting links to overlay images. Note that the projection is way off (I think) in the Northern route but the paths do overlay. Again, far from conclusive. The overlay is still far from exact. Indeed it seems that the hypothesized “shadow” track would have gone much closer to the satellite (close to 60 degrees elevation) than the southern tracks would imply. It will be interesting to see if a more detailed analysis can be performed, but if this was confirmed, then I am surprised no-one took the opportunity to rule out the “shadowing” hypothesis. If the the plane has been hijacked and this hypothesis has not been ruled out, the authorities would probably prefer not to let hijackers know how much information they have about the final destination of the airplane. Also, the fact that the distance and therefore arc for a what seems to be a single ping has been released can mean two things: (1) there is more info but authorities do not wish to have it known, or (2) there are no more arcs because the plane stopped moving., meaning more than one final ping indicated the same or very similar distance, meaning the passangers may be alive, meaning… back to what I said before. Of course this is highly speculative, but “absence of evidence is not evidence of absence”. I didn’t like how messy the v2 version was so I created this v3 version of the full overlay. Feel free to replace the link and embedded picture in my previous post with this one. Note: Even with significant skewing of the three overlain pictures, I can’t get all the coastlines to line up so I don’t know if this obvious difference in projection/perspective in the two charts creates sufficient error to overcome the obvious discrepancy between the southern track and the northern “shadow track hypothesis” track. I don’t have enough information (and nowhere near the required tools/skill) to calculate the transform onto a curved surface. The three primary sources for my overlay attempt are the AMSA southern track maps, the NTSB Inmarsat last ping arc chart, and the skyvector.com plot of the SIA68 flight along route P628. Could this be the previous arc surfacing at last? This is just a rehash of information that was available yesterday with the small tidbit of the “deleted files” from the pilot’s home-based flight simulator that has been reported all day today. has anyone made the mirror-image map of the australian (southern) search area on the northern arc? the two problems are (roughly) symmetric, up to winds and currents. roughly uzbekistan by eye? Slightly off topic perhaps, but what would be the likely outcome of an uncontrolled fire of the sort described here.. Presumably this would result in an initial set of circumstances which would make it difficult for the pilots to remain in the cockpit, and might eventually lead to the aircraft being uncontrollable. It would also most probably result in the pilots attempting to switch off all but essential electrical systems in the hope of eliminating any electrical combustion source. IMHO, it would be highly unlikely that the plane would have been able to fly for a total of 7.5 hours if such a fire occurred after 1 hour of flight. I have now plotted a mirror reflection of the AMSA southern route reflected around an axis that runs from the last military radar fix (as reported by Keith Ledgerwood) to the surface projection of the 3F1 satellite at N0, E64 using the skyvector plots as used in my spherical projection. The routes do not diverge significantly until above Jaipur in Northern India. See: Link to merged SkyVector.com tracks and mirror of AMSA southern route. … I agree it would be a problem to actually “fly” the plane, but the autopilot would in theory keep the aircraft aloft, assuming the crew were eventually incapacitated by smoke or decompression due to damage to the aircraft skin as a result of the fire. I am simply looking for the most likely scenarios to fit the available data. This particular scenario also suggest likely reasons for loss of communications, and possibly even any erratic changes in flight path. I am looking for concrete ideas therefore to test and perhaps sink the theory. I should have been more clear. The article you linked indicated that the fire (while on the ground and accessible to fire-fighting equipment) burned holes “under the co-pilot’s window” which I take to mean structural failure. If the plane were travelling at cruising speed/altitude and holes appeared in the cockpit, I suspect there would have been significant failure; at the very least, the engines and autopilot would have had to work harder (thus burn more fuel) to maintain speed and altitude and therefore, the plane would have not stayed aloft for 7.5 total hours. It sounds like there are some sightings in the Australia search area so perhaps we will all know what really happened soon. I jumped out of bed last night when I saw the clip Tim showed of what looked like the missing plots of the previous ping arcs and possible flight path, and started searching to see if the missing data had finally been released. But again I found nothing. Has anyone checked to see where the figure used in the CNN report came from, and whether it showed actual Inmarsat data? With all the speculation on everything from shadow planes to black holes and the Bermuda triangle, I just don’t understand why the cable news channels don’t seem interested in discussing what will probably turn out to be the most important tool in solving the mystery. Combining the WP chart with the Reuters/Scott Henderson chart and the Skyvector plot of the SIA68 route, I believe that if the 4:11 and 5:11 ping arcs are accurate, then the SIA68 shadow hypothesis fails. I still think the Southern route is strange if the WP second graphic is correct for points 4, 5 and 6. In any event, this is my (bastardized) version of the arcs using Google Earth as the initial base. Just to note Scott Henderson said his arcs were for example only. But CNN’s data appears to be accurate and shows that 4.11 and 5.11am were close together as in your chart. Fitzcarraldo mentioned the Washington Post article of March 15 that did show the missing plots. I clicked the link, and it seemed strangely familiar. I could swear I had read that very article a few days ago, and it only showed the final arc. The URL of the article indicates it was published on March 15, but it does include the missing data points. It also includes data about the sightings of possible debris, which were not announced until March 19. One would hope the Washington Post would not be making changes to their articles without documenting them. But one would be wrong. I read the whole article again, including the comments, and there was my very own comment asking about the missing data points. I can’t comment yet as I’m dissecting some new data, plotting on charts and hope to comment in the next couple of hours. But wanted to let you guys know that I am here and watching the conversation. I am not 100% comfortable in the Washington post article. I would like some raw data or something more factual than their “pretty” slide. As you’ve described the Inmarsat Aero services within this region use the satellite above the Indian Ocean/Arabian Sea. These satcom transmissions use the L-Band transponders on the satellite, shared among any/all aircraft in the satellite’s footprint. I understand that 9M-MRO didn’t have a high gain satcom antenna installation so didn’t have comprehensive satellite comms services. There’s many images of of the Malaysian B777 fleet and some have the high gain array (it resembles a saddle on the upper fuselage aft of the two ADF antenna) while the others have a small sharkfin antenna, a low gain antenna adequate for the basic SITA data services provided through Inmarsat. The comms protocol employs TDMA (time division multiple access) to multiplex transmissions from the corresponding aircraft onto the common L-Band frequency and while Inmarsat’s implementation is proprietary it’s typical of such a system that a periodic reference frame is sent out to the aircraft to ensure aircraft satcom data unit (SDU) TDMA slot timing is synced with the satellite/ground station. The aircraft SDU would acknowledge that reference frame transmission to reacquire its TDMA slot. The system obviously logs the times of the reference frame transmission broadcast and those stations/aircraft responding., it would have to drop non-contactable stations at some point in order to free up slots to new stations coming into its tranmission footprint. For those timings to be useful it’d be necessary to have at least one at a known station/aircraft position, more than one at a known location would be even more useful as the response times of the acknowledgement from the aircraft SDU would be indicative of distance. However, I’d question whether the timing between the reference frame and the ack is deterministic and could be relied upon for ranging. My interpretation of the arcs is that the analysis suggests only that the aircraft lies within that circle and the information doesn’t indicate a heading along which the aircraft flew. Great to see you here. I have been fascinated with your hypothesis and Tim has been instrumental in assisting me with my thought process to better visualize (in an admittedly amateurish way) the existing route hypotheses, yours being my favorite. I am currently working on trying to visualize the ping arcs from the WP article and the CNN visual and overlay one of my earlier attempts to mirror the southern route with the SIA68 flight path. I am wholeheartedly in agreement that the raw data would be vastly preferable to the existing charts and diagrams in who-knows-what-projection or scale. Lat/Long or distance from Satellite please! 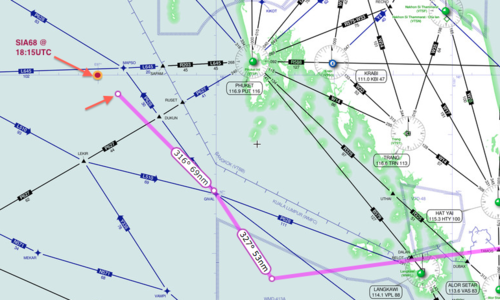 My previous chart with the SIA68 crossing the Indian coastline may have been off by too much. I am still unsatisfied with the lack of 3:11 arc but I have attempted to overlay the mirror route (of the southern track) with the SIA68 route on a spherical projection. Given the spacing between 5:11, 6:11, 7:11 and 8:11, it would seem that that this was not straight and steady flight under autopilot. From my view, between 5 and 6, the path was more much more radial (to satellite) than between 6 and 7 (more parallel to arcs) then again even more radial between 7 and 8. Either the arcs are not accurate (I know they are not precise) or this was not a straight flight path between 5 and 8. When I look at even spacing between arcs (assuming constant speed) the southern route cannot intersect the 4, 5 or 6 am arcs on the southern route as drawn so something is really off with either the data or my math. Timing: as I discussed above the timing based on a protocol handshake between the satellite and aircraft may not be suficiently deterministic to help a fix. Signal strength: 9M-MRO was equiped with a low gain satellite antenna (source of this being photographs of Malaysia Airlines B777 fleet) so no beam steering/focussing as is possible in the phased array high gain antenna. The gain of the low gain antenna will be a fixed radiation, distributed in a donut pattern: it’s basically a stick antenna encased in a aerodynamic sharkfin. If the aircraft was to follow the track described by the initial reported heading change over the Gulf of Thailand (I’m not an advocate of the zigzag navigation over the Straits of Malacca) then the track would take it out over the Indian Ocean & the centre of Inmarsat’s IOR satellite beamprint. In the middle if that beam an omnidirectional antenna would not be radiating at its most efficient with another antenna located in its longitudinal axis. So, if Inmarsat is reporting the aircraft terminal’s signal strength as part of the pings I trust they are factoring the aircraft’s antenna radiation pattern/gain. The wash post article is gone… anyone have a source of those other pings that is still live online?!!!!!!! So did the WaPo make up their arcs for “illustrative” purposes? That might explain the implausibly high speed in the part of the supposed route with missing data. As the Washington Post article on which he was commenting (see also the above link) clearly points out, without the preceding arcs it is nigh on impossible to perform further analysis. The fact that the earlier arcs on the Washington Post graphic I linked to yesterday have apparently been ‘pulled’ by the newspaper (it’s a good job Tim Farrer copied it and posted it here on his blog post) now makes me think that the Washington Post also guesstimated the earlier arcs. I had hoped that at least the arcs in the WP graphic had been obtained from a reliable source such as the US NTSB. It’s now looking like more likely that the WP also made them up. Until (if ever) more real data is released, I think analysis by the public has gone as far as it can. Everything else is pure speculation, and that can go on ad infinitum. So Scott Henderson could be responsible for sending the Australian’s on a complete wild goose chase? I’d been trying to track down, unsuccessfully, a source for the raw information that was used to produce that graphic. I trust that the NTSB, AAIB and Inmarsat will be making more credible deductions from the ‘ping’ data. That blog post link you posted above is one of the few coherent discussions of the ping arcs and their relationship to flight paths which most media outlets seem to be confused about; unfortunately it doesn’t add any additional information to this blog’s conversation thread since it seems we all seem to understand the implication of the ping arcs here. The article in your link (by Scott Creighton) seems pretty harsh to Scott Henderson who (I thought) pretty clearly stated that he was using assumptions and he explained that his shaded areas (which he also clarified were the only parts he added) were assumptions and he stated that his source was a Reuters chart. In any event, these reversals keep your hypothesis from being ruled out. BTW, I am looking forward to the new analysis that you teased us with up thread. The “mutating” WaPo article is interesting… My continued thought is, why has the Inmarsat data not been leaked? It has apparently gone through a number of hands (UK, Swiss, US/NTSB, AMSA?, Malaysian Government) and for it not to leak is amazing. Ultimately, I sit here frustrated after spending hours trying to fit the existing ping arc assumptions from WaPo, Reuters, CNN and AMSA charts to various hypothetical flight paths. If I were to be honest, I would have to say it was an interesting exercise and I didn’t really expect to prove anything but I had hoped to be able to rule out some theories. At this point, I can’t seem to let it go and I can’t seem to get any reliable data to work with so now what? I just read a space.com article on the pings and I would like some clarity. They are saying the pings originate from the terminal (aircraft) side but that would make the time resolution rather inaccurate wouldn’t it? Even if it is TDMA and IIRC this “ping” is a proprietary protocol by Inmarsat, it probably follows the RFC for ICMP pings fairly closely and the latency would then be calculated by the terminal since the host (in the space.com sense this would be the satellite) would only have a one way traffic with no fully accurate time datum. If the time discrepancy is <1ms I suppose it wouldn't make much difference. The term ‘ping’ in relation to the Inmarsat comms is quite different to an ICMP ping. The satellite comms system is very deterministic whereas the Internet Protocol (of which ICMP is a part) is far from deterministic. The Inmarsat protocol requires the aircraft terminals to transmit in a specific time slot whereas IP is quite the opposite. It’s the requirement to verify that time slot that drives the transmission of the periodic ‘ping’, I suspect the term is being used for familiarity. In the Inmarsat synchronous comms world it’s strictly not termed a ping, more likely a sync/ack handshake necessary to a) confirm what remote terminals (aircraft) are still communicating; and b) resync the slot timing. I just found this paper from SITA that describes the Inmarsat communications in some detail but it is not overly technical abut the protocols (it provides references to the specs). I found the link from this thread . Thanks for the clarification. After skimming the paper I referenced above and before seeing your comment, I had come to the conclusion that my ICMP Ping mental model was all wrong. Can you confirm that the sync/ack message pair is initiated from the aircraft (remote terminal)? Do you know what order of magnitude the timeslot size is (are we talking 100ms or 0.001 ms)? I don’t have the detail of how Inmarsat implement that protocol, this is the low level link control ‘stuff’ they’re implementing as a logical channel the SITA can deliver their user services (the ACARS feeds to the airline, Boeing & RR, etc). However, it’s the core that controls it not the terminal: think of a railway – you just jump on a carriage when the train passes subject to the railway’s timetable. Your clock has to sync with the rail companies clock so you’re on the platform at the right time for the right train. Inmarsat-3 F1 has 7 spot beams and 1 broad ‘earth’ beam. It’ll have some event based telemetry associated with remote terminals: signal level, response time for ACK, etc. If the telemetry from 9M-MROs ACKs can be simulated for certain lat/long/FL positions then there’s a means to build its route. To re-iterate, I’m working from comms principles here, I don’t know the specifics of Inmarsat’s protocol but essentially that generation of technology was all trying to achieve the same thing but optimise transmission over one medium or another. OK, I would like to explore a theory. Let’s say that the analysis uses the signal strength of the signal from MH370 antenna as the basis for the size of the circles over the time of flight of the signal. Reason: Poor timing data. Let’s also say that what GuardedDon said, on March 21, 2014 at 5:02 am is also true about the stick antenna on MH370 instead of the phased array antenna on newer installation. That the signal from the antenna gets weaker as the signal gets more vertical to the airplanes position. That would imply that the plotted arcs should be inverted with the 8:11 being the smallest and the 5:11 arc the largest. This produces two potential paths of MH370 that are more in tune with the last reported direction of MH370. West North West into the Indian Ocean and South West into the Indian Ocean. The West North West route fits the last direction seen on radar. It fits the eyewitness sightings over Maldives and the fishermen about a low flying airplane. Plus other proposed results in this blog. A low flying airplane fits the turn to an emergency airport and a decent to pattern altitude for landing. Direction and altitude can be set by the pilots. The airplane will make a normal turn and decent to the set position. Pilots are then overcome by fire. They do not change the heading nor altitude. Plane eventually loses autopilot and wanders West to Maldives with engines running. As seen by eyewitnesses in Maldives. What am I missing??? Yes, I know. I gave that precise link in order to show the comment from Scott Henderson at the bottom of that Web page. Dealing with a lot of stuff over here guys – thanks for keeping the discussion alive. I will tell this little group here that I was able with the help of another individual to get Inmarsat to extract “ping” timing data from the SQ68 flight that can be used to differentially compare with the known data from MH370. It’s in the hands of two individuals at Inmarsat. I haven’t been provided the data, but know it has been extracted. That is great news. I eagerly await the results. REPORTER: We have received a report that the plane flew due south after flying west of the Andaman Islands, can you confirm or deny this report? AMSA: That would be a good assumption. My strong bias (and I don’t know how or why I formed this bias) is that I want to test (or not) Keith’s hypothesis with solid data before entertaining the southern route as a likely outcome. Just as a recap, what is the time of the earliest confirmed ping after the plane was last seen on radar? 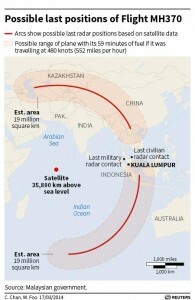 It seems to me the suggestions above are that the plane went out to the Andaman Islands before either heading almost due south, which would basically correspond to the extension of the Australian tracks and would be consistent with point 6 on the full WaPo chart (stating that the last contact may have been near the Andaman Islands at 2.15am). That of course is assuming that yesterday’s WaPo assertions (and the associated WaPo and CNN ping arcs) were actually accurate, which may no longer be a valid assumption. This leads to the problem with the southern route that (if the arcs were correct) in the three hours between roughly 2.15am and 5.11am the plane would have had to fly from 10N to 20S (i.e. a speed of 600 knots, above the 590mph max speed listed in Wikipedia), and then in the subsequent period reduce speed to around 7 degrees of latitude per hour (420 knots). However, over the whole period from 2.15 to 8.11am we have a more reasonable speed of about 500 knots (approximately equal to cruising speed). So if the southern route from the Andaman Islands is correct (and it must presumably be deemed viable for this amount of effort to be exerted in the search) then the ping arcs are likely placed incorrectly on the WaPo map. I note that the WaPo legend on the left side of the chart says “Estimated range of a 777-200 traveling in a straight line for 7 hours”. I think therefore they’ve just made a simple error and assumed that the ping arcs are spaced out over 7 hours, not the actual 6 hours from 2.15am to 8.11am. I would therefore suggest fixing the WaPo estimates by identifying the correct number of ping arcs for 6 rather than 7 hours at regular distance intervals (~8.5 degrees of latitude per hour) on the Australian tracks between the Andaman Islands and the 8.11am ping arc and using these as a basis for estimating northern track waypoints. The alternative northern track (given there would be no reason to assume a straight line constraint for the entire period but presumably flying at cruising speed would be the most efficient option if the objective was to maximize range) would then appear likely to be hypothesized to follow the SQ68 track before heading slightly west of north from a point close to the coast of the Indian subcontinent, ending somewhere in the region of the China/Kazakhstan border. The angle relative to the ping arcs can be determined based on the number of miles expected to be covered each hour at cruise speed. Obviously the issue there is that the plane would then be expected to have been detected by military radars in the region. I think we can agree that the WaPo ping arcs are incorrectly spaced and should be corrected per your suggestion (~8.5 degrees of latitude per hour). I note that the assumed ping arcs on Scott Henderson’s chart appear to be more reasonably spaced – maybe at about 9 deg of latitude per hour. I understood the WaPo legend on the lower left and upper right sides of the chart, “Estimated range of a 777-200 traveling in a straight line for 7 hours”, to denote the extreme edges of the map. That’s why just about anything below 50 deg S latitude or above 60 deg N latitude is cut off. Has anyone tried analyzing this with a spreadsheet? I’m thinking of a table with time being the left column (2:11, 3:11…. 8:11). Then one could list the distance from the satellite for the known SQ68 track at each of those times. Then, based on back-extrapolation of the average NTSB high-probability constant-heading/speed southern track, one could list an estimated distance from the satellite for MH370 at these times. One could also list an estimated uncertainty (error bar) of the estimated MH370 distance based on any assumptions such as ping timing error, track extrapolation error, ground speed uncertainty (where is the plane assumed to turn south), etc. Then one could plot a graph with time being the horizontal axis and distance from the satellite (with error bars) as the vertical axis. It would be interesting to see how long the SQ68 track stays within the error bars of the MH370 track. From this we might gain additional insight into the shadowing hypothesis without frustrating efforts to overly charts of varying/unknown projections. On the other hand, until real intervening ping data becomes available, this effort may also be fruitless since the error bars on the earlier extrapolated times (2:11 – 4:11) may be too large to add any meaningful information. I have not seen any Thai radar plots on the Web, so I do not know at which location and time they lost track of MH370. And I have seen nothing from the Indonesian authorities (Sumatra) either. If one plots a line from IGREX waypoint (N9°42.54′ E94°21.56′) to the South Pole, it passes to the east and relatively close to the location of so-called Object 1 on 16 March (S43°58’34″ E90°57’37″). If one plots a line from DOTEN waypoint (N10°45.53′ E89°59.19′) just to the west of the Andaman Islands (DOTEN being my speculation as to the intended heading after IGREX) to the South Pole, it passes to the west of, and even closer to, the location of Object 1 on 16 March (which, due to the prevailing ocean current, would be expected to be east of the aircraft). The aircraft could have followed E90° south on autopilot (Track Select) until the fuel ran out some time after the 08:11 MYT handshake with the satellite. I matched that up with an IFR chart and studied it. If that is correct and I’m reading it right, the waypoints that have been published over the last 14 days are WRONG. The radar in the picture shows a plane traveling over VAMPI and then MEKAR on N571. I’m working to get at a contact in Malaysia to try and confirm this… If this is correct, it is HUGE news and it actually proves my theory even more (I’ll explain if that is the case). The radar plot clearly indicates the aircraft was last detected by the Malaysians near MEKAR. I assume all the yellow tags relate to MH370 as the radar plot appears decluttered, but surely the annotated white circle and the white arrow near E98° do, so the assumption of VAMPI > MEKAR on N571 looks plausible. It’s bunk. It’s clearly a plot of UAE343. It would be impossible for that to be a plot of MH370 unless it went way south back over Panang (it didn’t). Load of crock – Malays showed this to the families in Beijing. Hmm… In that case, I wonder why the Malaysians were showing that slide to the families. I calculate it was approx. 11 nautical miles east of the ground trace of the E90° flight path I mentioned in a previous post. That is even closer than the ‘Object 1′ reported by the Australians, which I calculate was approximately 43 nautical miles east of the ground trace of the E90° flight path. I also calculate that the two reported locations are approx. 68 nautical miles apart. That would appear to support the idea that the plane flew at least as far as the Andaman Islands before any turn to the south. Interesting. I had been wondering about the ‘silence’ from the Indonesians. That makes me still more inclined to favour the DOTEN waypoint and a turn south onto E90°. Even if the turn was not made at DOTEN specifically, I have a gut feeling someone in the cockpit set E90°; it’s a clear run over ocean all the way down. The distance from DOTEN to the object on the Chinese satellite image from 18 March is approximately 6,166 km. The distance from IGREX to the object on the Chinese satellite image from 18 March is approximately 6.070 km. According to Boeing and Wikipedia, the typical cruising speed of a Boeing 777-200ER @ 35,000 feet is 905 kph. b) the travel time from IGREX to the vicinity of the object would be approximately 6.71 hours. According to Wikipedia, the maximum speed of a Boeing 777-200ER @ 35,000 feet is 950 kph. d) the travel time from IGREX to the vicinity of the object would be approximately 6.39 hours. The Malaysian military lost track of the aircraft at 2:15 MYT (or thereabouts, as I have seen slightly different times mentioned on the Web), and the last handshake with the satellite was at 08:11 MYT. Thus the aircraft must have gone down sometime between 08:11 and 09:11. If it broke up just after 08:11, the airborne time (including unpowered or uncontrolled decent) since contact was lost would have been approximately 5.93 hours. If it went down just before 09:11, the airborne time (including unpowered or uncontrolled decent) since contact was lost would have been approximately 6.93 hours. All the estimated travel times given in (a) to (d) above fall inside this estimated airborne time window of 5.93 to 6.93 hours since the Malaysian military lost track of the aircraft. Therefore the objects found by the satellites could conceivably be debris of MH370. The above calculations of distance and flying time do not take into account the quantity of fuel loaded or how the aircraft was flown. However, MH370 departed KUL at 00:41 MYT and the MAS CEO said at a press conference on 8 March that the “fuel can last until 8:30 a.m.” So it also appears there was sufficient fuel to reach the southern Indian Ocean area where the objects were photographed. And 08:30 MYT happens to fall between the last satellite handshake at 08:11 and the never-received 09:11 handshake. I hope they find some debris soon, even though it is like looking for a needle in a farm full of haystacks. The multi-national resources now deployed are significant, and apparently the Chinese are moving even more equipment down there. In response to your post, March 22, 2014 at 8:24 am, on the subject of Indonesian capabilities. The latter is in Indonesian, Chrome will translate. Wikipedia describes that no air services are operational to Sabang the most northerly site. That the Indonesians didn’t detect anything could be diplomatic speak that they weren’t looking. 1. Before Acars was turned off, the plane sent a burst with GPS data, and, likely, bearing. He said SITA should have that info. 3. It was the ping’s RT time to the satellite (times speed of light, I assume) that provided the concentric rings in the various graphics – one every hours for 7 hours. 4. It was the “increasing number of milliseconds” each hour that told them the plane was “moving away” from the satellite. 5. If I understood him correctly, the E64 satellite spot beam is divided into sectors, and by extrapolating from the “curve of the spot beam” they could create a rough direction of travel. They assumed the plane was on autopilot at cruise speed. He called this “nothing more than average dead reckoning.” Even if I misunderstood this sector thing, I assume one could create a dead reckoned bearing from the plane’s last known point, across the arcs, intersecting with each ping circle, and plot a path very similar to NTSP’s projection. There would be a northern projection, too, of course, but for whatever reason – I assume lack of radar contact over land – they focused on the southern ocean. @6m41s map with red dots = satellite pings of all online inmarsat subscribers? Extrapolated flight trajectory through some of those dots = MH370 pings? BUT weren’t we all convinced they just have distance from satellite circles, no “dots” without triangulation possible? -> can we figure this out? First, thanks for posting the new picture with the radar tracking data. re: your assumptions for flying time. (@KeithLedgerwood I am not a pilot so I would appreciate your input on this) By my calculations for fuel load, (based on the international fuel reserve guidelines I have referenced above and validated with a pilot friend) the craft would have to have 10% + 45 minutes + 200 km to alternate airport + climb-out and 2nd descend. From my calculations, (I took two approaches – one for max range and the other for max endurance = ~80% power of max range) 7.5 hours of total flying time is VERY close to the maximum range time in the air (my calcs are imprecise but suggest 7.75 hours is a reasonable mean endurance for max range) – so roughly 15 to 20 minutes of engine power after the final handshake if flying for max range (i.e. at cruising speed) – un-powered descent would inevitably follow. re: Flight speed (thus distance if straight and level), fuel consumption and thus endurance in the air, the Max Range vs. Max Endurance equates to a significant difference in flight (air) speed. Max Range is ~80% of the power required for Max Range (forget about Max Speed, it eats fuel very quickly and the 8:11 handshake would not be possible by my calculations – Max Endurance would not have an airspeed high enough to reach the 8:11 handshake “ping” track if traveling due south). Let’s consider the following Southern route conjecture using your assumption of DOTEN followed by a Southern heading (I am using S35, E89 as the Northernmost point of the AMSA search area as first announced). Entire flight path assumption is as follows: Depart (0045) KL to PIBOS at 250kn, (then everything after at 490kn cruising speed) to IGARI to VAMPI to GIVAL to DOTEN (0222) to S35 E89 (essentially due south). Total flight time = 8h4.5m and total distance is 3956.6nm. This is conceivable from a flying time and distance perspective if no erratic flying and no strong headwinds. Max Endurance speed ~400kn given the final heading from DOTEN and assumed direction of due south would not put MH370 close to the 8:11 ping time and would have had to have flown for 9h53.5m to reach the top of the search area (and would have been powered at 9:11. From his chart, I estimate the location (I’ll call it ‘X’) to be circa N7° 51.39′ E97° 10.10′ (approximately 240 nautical miles from Butterworth air base). I calculate approximately 368 km from X to IGREX (0.41 hours at typical cruise speed; 0.39 hours at top speed), and approximately 853 km to DOTEN (0.94 hours at typical cruise speed; 0.90 hours at top speed). b) the travel time from X via IGREX to the vicinity of the object would be approximately 7.12 hours. d) the travel time from X via IGREX to the vicinity of the object would be approximately 6.78 hours. A qualified long-haul wide-body passenger aircraft pilot would need to cast his eyes over the above and comment on whether I’m on the right track or wide of the mark. It’s late on this side of the Pond, so please forgive me for delaying reading your latest post (and the three preceding it) until tomorrow morning. Looking forward to studying them. My Google-fu also seems to be malfunctioning for this particular information and anything concrete related to the Satellite handshake distances. I was working on my last post while a number of other posters added information and questions but I don’t think the new information affects what I included in my post. Re: MtKlimber’s question, I think you and I addressed it independently but ultimately in much the same way with the exception of the max speed. Check my discussion on the top speed – I think top speed would increase the power requirements to a significant extent and thus the fuel would not last to the 8:11 ping response. – I am hoping that @KeithLedgerwood will add his input to this part of the discussion. Thanks for adding the discussion from Inmarsat’s spokesman. It gives a little more context on the pings and confirms most of what Tim has posted in his blog posts on this topic. The most interesting part to me is the discussion of the spot beams. I was under the impression that the spot beams were not able to be used (I thought only the global beam was possible) for MH370 due to lack of equipment on the aircraft but perhaps I misinterpreted/misunderstood Tim’s initial posts. That’s a very helpful summary. Where things fall down slightly is in point 4. The ping time could not have been increasing in each of the hourly intervals, at least not between 2.11am and 3.11am, if the plane followed the southerly route because it either went further west to the Andaman Islands before turning south, or headed straight over Indonesia and was missed by radar there (see this comment for an example chart). Both of these two southerly route options and the northerly shadowing hypothesis would also appear likely to have ping times staying roughly constant between 3.11 and 4.11am, as they would involve travel roughly parallel to the ping arcs (across the equator going south or into India going northwest). So I’m puzzled by point 4. And just to clarify on point 5, the “sector” thing is really just an issue of the distance traveled at cruise speed in one hour, combined with the distance between the ping arcs, gives you an angle at which you must be crossing the ping arcs in that period (if you try and draw a straight line consistent with multiple hours of data). That’s what the Australians/NTSB did, based on two different possible speeds, and apparently an origin either close to the last radar position, or an alternative point near the Andaman Islands. 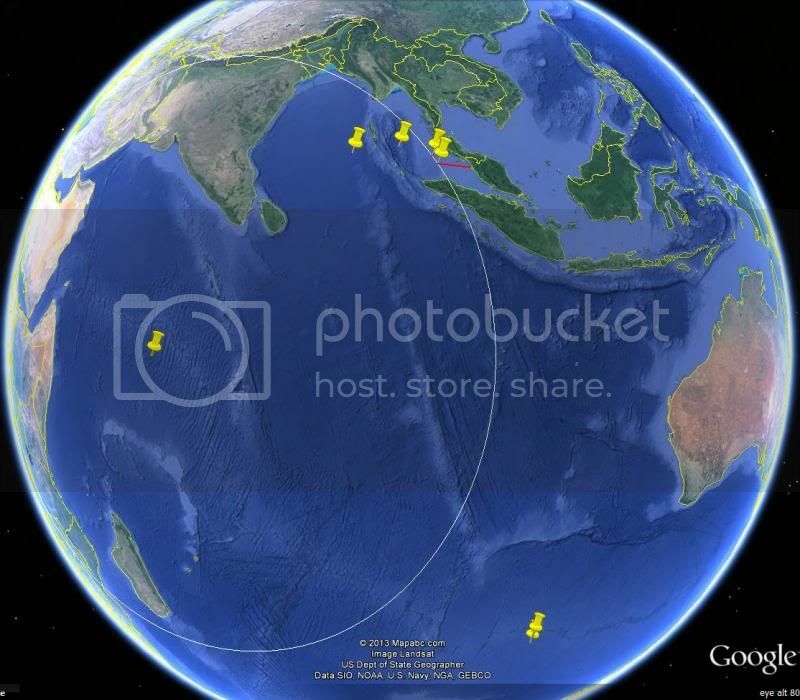 The “spot beam” referenced is the global beam, not one of the regional beams. The radar position is given on the Beijing photo as 200nm at a bearing of 295 (or is this altitude of 29500ft?) from Butterworth AB (Air Base?). I have been shown another photo which indicates that the other point marked with an arrow (to the right of the white circle) is Perak Island, 89nm from Butterfield AB at 279R (bearing?) reported at 2:02am. This should give a speed indication for the 20 minute period that elapsed between the two reported positions on the radar plot (and that speed appears at first glance to be pretty slow). KeithLedgerwood feels this radar plot is incorrect, but I’m more inclined to believe that the prior statements about waypoints were approximate (rounded to the nearest waypoint?) since the statements were referring to the radar plots at the time, and specifically noted the plane being “near” and “heading towards” these waypoints, not that the plane was actually there. However, I acknowledge that there are still inconsistencies, in that for example the waypoint article stated that the plane was last detected at 2.15am whereas the photo states 2.22am. I assume that the bearing they discussed is True and not Magnetic. Oops, just checked and magnetic declination around Malaysia is tiny (0.3 W) so True and Magnetic are essentially equal. Hi Everyone: I have found this thread about the Inmarsat-3F1 pings to be really useful, so thanks to all contributors. I have appreciated the mashups using Google Earth, but… Google Earth uses a spherical planet (which it isn’t!). Thus I have set up the situation in STK (produced by Analytical Graphics: agi.com), which uses a proper geoid (WGS 84 or whatever else one might care to use). Further, there have been many analyses and (especially) graphics in the media that assume that the satellite in question was orbiting at the nominal geostationary altitude and directly above the equator. It was not! In fact Inmarsat-3F1 was located (by my calculations using STK and other tools) over 400 km above/north of the celestial equator; it was slightly below the nominal 35,780 km altitude at the time in question (i.e. 00:11 UTC on 2014/03/08); and the sub-satellite point was 0.589 degrees in latitude/65 km distance north of the equator, and slightly to the west of the nominal 64.5 degrees longitude. Obviously this affects any calculations of the ‘arcs’ around/between which MH370 may have been at that time: they are not really symmetric about the equator. I have no more information than anyone else who has posted here, and I’d surely like to know the precision of the time delays (whether derived from TDMA offsets or otherwise) from Inmarsat or anyone else who knows; but I have estimated a precision/uncertainty of 1 millisecond (maybe less). According to the text on the Malaysian government slide I posted on 21 March, the last know position recorded by Malaysian military radar was 200 nm from WMKB (Butterworth air base) on a bearing 295°. The coordinates of that location would be N6°50.32′ E97°20.33′. However, that location is not where the slide shows it graphically: the arrow on the slide appears to be pointing to a position just after MEKAR on N571. So what to believe?! The text or the graphics? With all the imprecise and conflicting information (at least in the public domain; we don’t know what the Malaysians, Americans, Chinese and Australians are working with), all our calculations are going to be very rough with wide error margins. It’s also worth bearing in mind that it is possible the Inmarsat data is only part of the information they have that led them to focus their search on the south Indian Ocean. Anyway, I now assume the last recorded position by the Malaysians was N6°50.32′ E97°20.33′ at 02:22 MYT instead of at 02:15 MYT at the position shown in Keith Ledgerwood’s chart (my previous post referred), which I assume he derived from the initial reports that the aircraft was last detected heading north west somewhere between GIVAL and IGREX (as shown in his chart). What graphics? As far as we know the concentric rings for the first seven hours of flight have never been released to the public. Only the final (eighth) ring, for 8:11 Malaysia local time, is public knowledge. Why has this information never been released? What is so sensitive about it that it cannot be made public? Since this information provides vital clues to the flight path and final position of the missing aircraft, it should be released. Are the first two rings, at 1:11 local time and 2:11 local time, consistent with the location of MH370 reported based on civilian radar and military radar, respectively? If you are to publish on this topic, these basic questions should be addressed. Thank you! So here is one more complicating factor. It appears (from PPRUNE) that for flying on a bearing (as opposed to flying waypoint to waypoint), the default mode in the 777 Flight Management Computer is to follow a bearing with respect to magnetic north/south not true north/south. And while declination is minimal near Malaysia, it becomes a very significant issue in the Southern Ocean as you approach the search area. It seems that the track proposed by NTSB may not take this magnetic variation into consideration. So either the southern track (and thereby potentially also the search area) is wrong, because the implications for the ping arc crossing points would be rather different, or the plane’s FMC was specifically instructed to fly to this area. 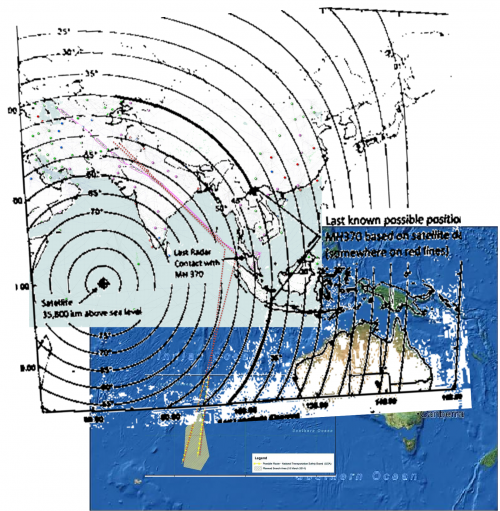 What if any waypoints could the plane be directed to in the Southern Ocean/Antarctica that would be consistent with a straight line track from the Andaman Islands or the last known radar contact? Indeed. As I wrote a couple of days ago, until (if ever) more real data is released, everything is pure speculation. Just to add to that pure speculation, if one assumes the last known position was as written on the Malaysian slide in Beijing (my previous post referred) and the aircraft remained over water, avoiding crossing Sumatra itself, and followed a path to the location where Object 1 was on 16 March, it would have covered a distance of roughly 5905 km which, at cruising speed, would have taken roughly 6.52 hours (6.22 hours at top speed). Given the Malaysians reported in Beijing on 21 March that they lost track of the aircraft at 02:22 MYT, not 02:15, the satellite handshake time window I mentioned in an earlier post would become 5h49′ to 6h49′, so it remains conceivable the aircraft came down in the south Indian Ocean, especially if Object 1 drifted south between 8 and 16 March, possible given the prevailing currents and winds. But, without the preceding hourly satellite arcs, this is all speculation. The Indonesians have shared no civil or military radar data from BTJ on Banda Aceh? This comment stream has been instigated by Tim Farrar’s two blog posts that shared a great deal of knowledge of the various communications capabilities onboard the lost aircraft, 9M-MRO, serving Malaysia Airlines flight MH370. However, I remain to be convinced that there is sufficient information to support the hypothesis of loss in the southern Indian Ocean. I cannot find any source that categorically states it came from the NTSB. The satcom ‘handshakes’ reported as received through to 08:11 on Saturday by Inmarsat remain a source of speculation. Inmarsat is not a direct service provider to Malasia Airlines, they have presented their findings to SITA who deliver the airline data service to Malaysia Airlines over Inmarsat’s network.. Certainly, Inmarsat will be providing expert service to the investigation team but specific public communication is not their responsibility. From publicly available images it’s evident that the aircraft, 9M-MRO, was fitted with a low gain satcom antenna suitable for only low data rate Inmarsat Aero-L services (1.2kbps) used by SITA’s value added data services like ACARS. Satellite communication has enabled SITA to extend its aviation information services to carriers beyond land based VHF comms. Onboard the aircraft switching between VHF and satcom bearers is normally automatic. Other aircraft in Malaysian Airlines fleet are fitted with high gain antennas capable of higher bandwidth data and broadband services. The rationale for different satcom installations would have most likely have been the revenue earning potential of some routes vs the cost of installing and, more importantly, subscribing to the service provider’s networks. I’ll return to the significance of the antenna types. 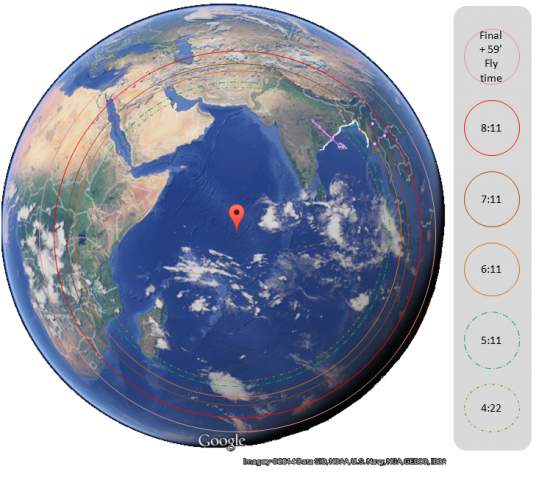 Unofficially generated maps seeking to illustrate potential tracks for 9M-MRO show two intersecting circles, the easterly circle being the aircraft’s estimated range from the point of loss of contact and the westerly circle describes arcs of possible aircraft position within the footprint of the Inmarsat-3 F1 Indian Ocean Region (IOR) satellite. The arcs are somehow derived from the round trip time (RTT) of satcom “handshake” timing with 9M-MRO reported by Inmarsat. Inmarsat-3 satellites are communications satellites, they’re not associated with positioning systems. The GPS constellation is a system of low earth orbiting satellites, the derivation of timing and ranging data by a receiver requires four satellites to be in range of the user terminal. Appropriate to a review of the reported handshakes is the RTT between the Inmarsat Land Earth Station (LES) and the Aircraft Earth Station (AES), a comment at the Professional Pilots Rumour Network shows calculations for (http://i55.servimg.com/u/f55/14/14/01/64/arcs_11.jpg) the difference in propagation delay for a signal relayed to a station directly below the satellite and one at an earth latitude of 40 degrees: the difference is approximately 620 microseconds on an overall RTT of some 250 milliseconds. That’s a difference of some 0.23%. I am ignoring the location of the Land Earth Station, possibly the Stratos facility near Perth (31°48’16″S 115°53’13″E), as it’s a fixed location. Any delay inherent in the transponder on Inmarsat-3 F1 is fixed also so it remains that the AES, the equipment on 9M-MRO, introduces the variable. The AES equipment includes the signal processing required to clean up its received signal and deliver the response. Is the internal processing time of the onboard receiver units and Satellite Data Unit (SDU) deterministic as it deals with variable signal strength and interference? My answer is probably, no. Why? a) this document ( http://licensing.fcc.gov/myibfs/download.do?attachment_key=-136047‎ ) shows that the Inmarsat-3 global beam gain is at its strongest in a circle bounded by latitudes 40N/S, the gain reduces to -2.5dB toward the sub-satellite point while only -1.5dB at the extremity. That is, the signal attenuation in greatest ‘under’ the satellite. b) an aircraft receiver will experience interference in its incoming signal as the signal is reflected off the sea (this challenge is discussed in papers related to contemporary, higher speed satellite data services), I suggest that this noise is more detrimental to signal reception as the AES approaches the sub-satellite point as direct reflections will be encountered whereas reflections will induce less noise as the angle of incidence between beam and ocean decreases. Refocussing on the antenna, 9M-MRO was fitted with a low gain antenna. Unlike high gain phased array plates that enable an AES to actively beam focus on the satellite the low gain antenna is passive and as a vertically oriented sharkfin, its gain will be compromised as the AES nears the sub-satellite position. Satellite communications, in basic principles, are no different from any other data communications system but the challenge is distance and, consequently, differentiating signal from noise. Digital Signal Processors provide the technology to push back those limits – DSPs also have the potential to introduce latency in protocol handling whie they process poor quality signals, albeit that delay has to be deterministic, the overall system operates in real-time. Potential for variation in latency: digital signal processing or frame retransmissions due to received/transmitted error. Potential circumstance for degraded communications: AES is closer to the sub-satellite position. So my conclusion on the ping/shake delay, especially if it was “getting longer”, is not that it suggests a southerly course but rather a course westerly across the Indian Ocean. An extension of that initial line that the RMAF determined from their military radar. No further turns, just straight. The arcs: simply the extent of the area where the aircraft might be found. So what is my motivation? Taking the limited information in the public domain, question it, validate my answers to make some foundations for further questions. I don’t rate human interventions high on the probability of causes here. Rather I suspect something significant occurred to the aircraft as it began its cruise out over the Gulf of Thailand around the time handover from KL FIR to Vietnam. That ‘something’ overwhelmed the flight crew and escalated to a point where the humans on the flight were incapacitated and 9M-MRO continued to fly on a selected heading under autopilot control until fuel starvation. a) AF447: while flying an A330 during a night sector the two pilots on the flight deck totally misunderstood the information that was being presented to them during an exceptional, but non-catastrophic, instrumentation discrepancy/failure and caused the aircraft to crash. Even when the senior pilot returned from his rest break to the flight deck he couldn’t resolve the situation. b) QF32: outbound from Singapore the A380 suffered and uncontained engine failure. The captain, Richard Champion de Crespigny, in describing the incident said “it was as if the wing had been cluster bombed”. While the A380 is also designed for two pilot operation, this particular flight had 5 pilots on the flight deck. The crew quickly ignored the endless ECAM warnings and alarms as they were not contributing to resolution of the situation. Experience won out over automation and all on board evacuated the aircraft without injury. Not only did the crew manage the flying challenges but they also managed to keep the passengers adequately informed and reassured. c) Helios 552: systems management failure resulting in no cabin pressurisation and hypoxia. Aircraft flew autonomously to fuel starvation and crash. d) BD92: crew incorrectly diagnosed an engine failure and shut down the serviceable engine leading to significant undershoot on diversionary approach. e) Many airframe structural failures. Most significantly an Aloha Airlines B737 in 1988 and a UAL B747 in 1989.
f) Southeast asian military radar capabilities: of dubious value to the investigation (or anyone). The response to these events can be described in terms of crew resource management (CRM) skills and aircraft systems knowledge. We’re told that the Malaysian Airlines captain had constructed his own ‘simulator’ at home: home simulators will not have the systems simulation required of a certified airline industry Level D full flight simulator or even a ‘cockpit procedures trainer’. Flight training simulators are not intended to teach a pilot how to fly, rather how to deal with procedures and exceptional events. Hobby simulators are essentially objects of entertainment. Finally, instilling adequate CRM skills has been a known deficiency among Asian cultures, Korean Air being a particular example which improved after a number of incidents. We often, in the west, forget the significant cultural and interpersonal communication styles that differentiate us from those in other societies. I’ve checked with some terminal manufacturers and they have all told me that the distance is estimated based on TDOA. Here is the manual/specification for the Inmarsat Classic Aero service. I’m told that the relevant ping is the R-channel burst. The burst timing specification (para 4.4.3.2) states that “The beginning of each R channel burst shall occur within ±300 μs of the beginning of an R channel slot”. Your chart of differential timing from PPRUNE is therefore very useful for estimating the accuracy with which the arc location is known. However, since TDOA is based on one way not the round trip delay calculated in the chart, the figures should be halved. Nevertheless, in the region of 40 degree arc the “1 degree arc difference” would be 300 μs and therefore by measuring the TDOA relative to the start of the channel slot and allowing for up to ±300 μs of error (as per the spec), the distance can certainly be calculated to within two degrees of arc, and with calibration based on the known initial position at 1.11am (and an assumption of only limited drift), the accuracy would be even better than that. The NTSB told the AMSA where to look. I think it’s safe to say the “hypothesis of loss in the southern Indian Ocean” came from the NTSB. The NTSB press release on 8 March shows an NTSB team departed for KL that night, so they were ‘on the case’ from Day 1. If we assume path is on autopilot then I would agree with the assessment that MH370 got no closer after sometime between 2:11 and 3:11 but without the raw data, it is impossible to tell and my primary point of frustration is why the ping data is not being released. It is stunning (to me) that this information (that should be quite neutral) is being kept quiet. Consider the following speculation: ASSUMPTION 1: If it is true that MH370 “got no closer to the satellite after 2:11″ (See MtKlimber comment on March 23, 2014 at 1:10 pm above) and ASSUMPTION 2: was on a northerly heading at the time (from Malaysian military radar information) of last military radar contact and ASSUMPTION 3: the 2:15/2:22 last contact at 200nm from BWH bearing 295 is accurate THEN Two Hypotheses (North and South) 1) NORTHERN HYPOTHESIS – MH370 would have had to have executed a slight turn to the north after 2:11 and before 3:11 (using KeithLedgerwood’s original plots **Note, these are currently questioned by Tim above and I have not fully analyzed Tim’s comment in this context yet**) from skyvector.com to place 3:11 and all subsequent ping distances further away from the satellite. Obviously this path would take MH370 within reach of many military and civilian primary radars and only KeithLedgerwood’s conjecture (following above or below another widebody) has any chance of explaining this hypothesis if we assume that these radars are staffed by semi-competent radar operators (since no other military radar contact has been noted publicly). SOUTHERN HYPOTHESIS – MH370 would have had to make a drastic turn to the South after 2:11 and could not have swung around all of Northern Indonesia to avoid radar at cruising speed and still have been further away from the satellite by the 3:11 ping arc. See: plot to show cruising speed from last Malaysian published radar contact and distance to satellite and assumed closest path to avoid radar. Obviously this hypothesis would necessitate MH370 to overfly or fly very close to Indonesia and it should have been within Indonesian military or primary civilian radar range. 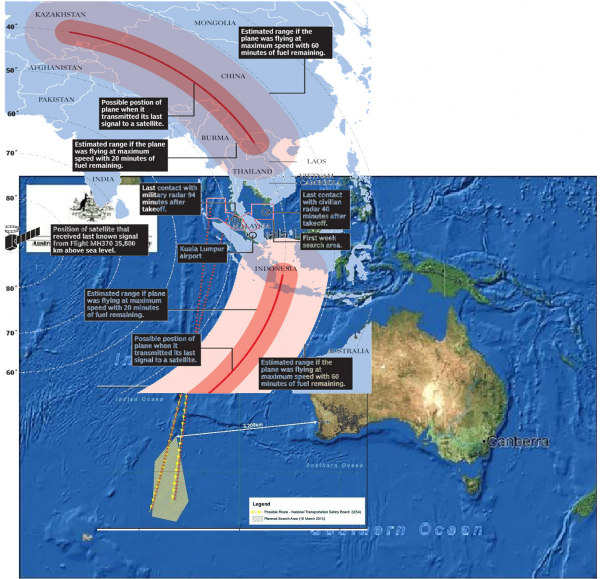 Ultimately this speculation requires (based on the assumptions stated) that MH370 must have flown within range of military radar on either the Northern or Southern route. I am of course aware that the Southern route takes MH370 within range of many fewer radar installations BUT the Southern Hypothesis requires a drastic change of flight path after 2:11 then a relatively straight path from that point on (so could imply mechanical failure or incapacitation sometime after 2:11. The Northern Route implies human intervention and most probably collusion or staggering incompetence. It is hard to say which hypothesis Occam’s Razor favors more. Thanks for posting that: it made me notice I had transcribed the coordinates wrongly in my post on March 23, 2014 at 3:49 am. I should have written N6°52.46′ E97°21.31′, which is precisely 200 nm from WMKB on a bearing 295° from Butterworth air force base according to SkyVector. To recap, based on the slide presented by the Malaysian government on 21 March in Beijing, I am assuming the Malaysian military lost track of MH370 at 02:22 MYT at location N6°52.46′ E97°21.31′. OK, my hypothesis is re-aligned to the southern ocean! I now understand how range is derived on the Inmarsat communications, thanks for that protocol description doc, I can see how the P & R channel handshake drives the timing. Good summary of the current understanding. In my mind anything involving mechanical failure and/or incapacitation seems increasingly unlikely. Mechanical problems would have resulted in a turn west for a possible emergency landing. If this was followed by incapacitation, it would have resulted in a continuous straight trajectory in a westward direction (autopilot should default to the same constant heading after passing the last waypoint). All the apparent maneuvering after the initial westward turn supports human intervention for reasons sinister or suicidal. 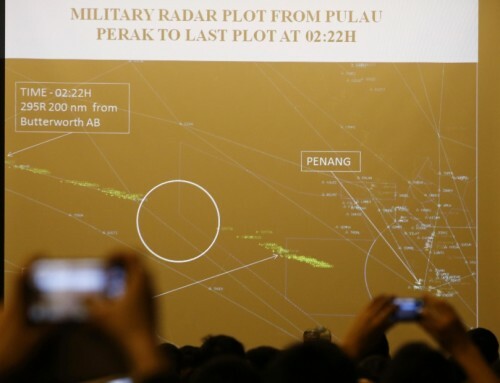 By the way, I would think Indonesian military radar should have seen MH370 simultaneously to Malaysian military radar. Since they say they saw nothing, I guess they have already admitted a lack of capability or watchfulness. For the southerly route, I suspect it wouldn’t have made much difference if MH370 had skirted the coastline or flown directly over Sumatra. For the northerly route, I wonder if India would be watching for targets passing over from Bangladesh toward Nepal? Firstly I am seriously impressed by the clarity of information presented on this blog and the calibre of the subsequent discussion. Reading this blog was one of the inspiration for creating the graphic that has been referenced several times. My main motivation was to communicate some of the probability based search logic likely employed by the authorities (including the NTSB), and show why several final endpoint theories were not plausible (e.g. Diego Garcia). Others were wondering why the search area in the corridors had narrowed significantly – and I hoped a graphic would aid explanation. I find Bayesian Search logic fascinating and I encourage anyone who hasn’t to read up on the search for the USS Scorpion. Some interpreted my graphic as a representation of known facts, and that is entirely my fault as a designer of visual information — I should have made interpreted and extrapolated information more differentiated. Anyway, to add something technical to this discussion: When it became apparent that the NTSB likely used a “straight track / constant speed” assumption for their prediction – I made initially excluded one important clarification / variable. Occam’s Razor would suggest testing a straight track / constant *AIR*speed track against the sat data. But to effectively test this option, you would have to test *Ground*speed against the sat data. To test against ground speed you would have to introduce a wind vector component. I *assume* the NTSB made allowances for this based on actual data. The ‘wind’ factor obviously could influence max distance travelled in the known flying time (as some have pointed out already), but may also mean that the mirror of the NTSB tracks in the Northern Hemisphere that I and others have hypothesised may not exist. Hey guys – I have some info from Inmarsat and hope to be able to share details soon. Can you guys help me with a quick question? Can you explain TECHNICALLY any scenarios you can think of that would cause a comparison of data between two planes, flying at the same time to result in identical timings yet Doppler information that doesn’t match. I don’t have much technical data to go on – so trying to come up with VERY technical scenarios and VERY technical questions I can drill down into from here. Welcome aboard. I agree that the signal to noise ratio on this thread is much higher than the “stuff” coming through regular media channels. For what it is worth, I think I understood what you were trying to do with your graphic and it was clear that you identified your sources and stated that you made certain assumptions. I thought some of the (after-the-fact) negative response you received was harsh. In any event, I am glad to see that you are contributing here now. re: the Wind speed, I agree and I had pointed to that as a significant unknown so if you have any access to windspeed data along the likely South and North tracks, I would be interested to see it. GuardedDon (and others): Thanks for the information sharing. The basic method used there is fine, but there are various inaccuracies in the assumed parameters (including the very first line). Plus, as I wrote earlier, Inmarsat-3F1 was, at the time in question, not above the equator; not at its nominal longitude; and not at the altitude stated in the above-linked graphic. These points do not, however, make a huge amount of difference to the bottom-line of the calculation. I noted previously that the satellite was not above the equator at the time in question (i.e. 2014/03/08 00:11 UTC), and it was in fact about 433 km above the equatorial plane at its altitude (35,793 km) at that time (and thus the sub-satellite point was 65 km north of the equator on the surface of the Earth). That means that for any given time-delay measurement the rings/arcs calculated (e.g. the well-known ring at 40 deg elevation angle) will not be symmetric about the equator, but rather will be symmetric about the latitude of the sub-satellite point at that time. However, as time passes the declination of the satellite alters (in accord with the satellite’s orbital inclination of 1.6346 degrees: over one sidereal day/one orbit it oscillates between declinations/latitudes this amount north and south of the equator). This in itself means that the rings calculated for other times (i.e. 11 minutes past the hour in preceding hours) CANNOT BE CONCENTRIC: their centres (the sub-satellite point at different times) shift north/south. In addition, the finite eccentricity of the satellite’s orbit (e=0.0005266) means that the satellite’s altitude varies from hour to hour; and also because this causes its angular speed to alter, it shifts in longitude backwards and forwards. Penultimately I note that in my post on my website (duncansteel.com) about 15 hours ago I back-engineered an estimate of the precision of the ping timings based solely on the statement of 40 degrees as being the elevation angle of the satellite from MH370 and hence the well-known ‘red arcs’. That is, I simply acted like a human recognizing a round 40 degrees as likely being based on a value somewhere between 35 and 45 degrees but an uncertainty as to a precise value (due to the uncertainty of the ping time delays). My answer on that basis was: up to one millisecond. I am therefore gratified to hear (from the posts above by timfarrar) that the actual precision is +/-300 microseconds = 0.3 milliseconds. Working forward from that one gets an uncertainty in the arcs of about two degrees. What that means is that where one sees graphics saying things like “MH370 must have been along this LINE” in fact one should interpret that as being “MH370 was likely somewhere within two degrees of this line i.e. between 38 and 42 degrees”. Finally: This has all been about the accuracy of the ping timings and thus the uncertainty of the rings/arcs. As discussed immediately above, the answer is an uncertainty of about 2 degrees in the arcs (i.e. 40 degrees means “somewhere between 38 and 42 most likely”). But, as I noted above, the satellite itself shifts through more than +/-1.6 degrees in declination/latitude each day. In consequence, the satellite’s real orbital positions cannot be ignored in these calculations: the movement of the satellite produces changes comparable to the ping timing uncertainty! With that in mind, I go back to the very first ring/arc graphic released by the Malaysian Government, apparently based on data from Inmarsat. It shows the sub-satellite point ON the equator, rather than the correct position almost 0.6 degrees north of the equator (at the time in question), and thus rings/arcs symmetric about the equator. Therefore that graphic is fundamentally wrong, opening up questions about all the various calculations that contributed to it. I will put a further post on my website (duncansteel.com) about this later. Jeff Wise’s quote of an Inmarsat spokesman is very interesting. 9) a circle centred on Inmarsat 3F1 cutting Placemark No. 5 (I’ll call it ‘the 2:22 circle’). I’m finding Google Earth and SkyVector do not give the same coordinates for the same geographical location, so I used that red line in order to better position Placemark No. 5.
c) the southern route would have crossed Sumatra (I suspect your comments, and similar comments by some previous posters, regarding Indonesian radar may be correct), arcing eastward over Sumatra then arcing westward further south (my rough calculation would put it over an hour later), which might explain the westward curvature of the NTSB plots shown in the AMSA slide (see link below). I don’t like hypothesis (c): it does not seem to fit with the direction the aircraft was travelling in the Malaysian government slide in Beijing on 21 March, and the distance travelled would be greater. I assume the NTSB team have taken all these factors into consideration, but, given the statement quoted by Jeff Wise, the south Indian Ocean hypothesis becomes very difficult to defend without access to the Inmarsat handshake circles preceding 8:11. I’m not a technical expert, but for the sake of speed, I will refer you to the first few paragraphs by Tim Farrar at the very top of this page (up to and including Key points #1 and #2). The short, qualitative answer is that identical timings means they are at the same range from the satellite while different Doppler readings likely means they have different relative velocities in the direction of the satellite (perpendicular to the “satellite arc”). For example, a plane on the ground or flying along the arc will show no Doppler shift while a plane flying at 90 deg to the arc will exhibit maximum Doppler shift. If plane A is approaching plane B at an angle relative to the path of plane B there may be a detectable difference in Doppler shift. Same result if plane A is flying s-turns (or some other small course correction) while proceeding generally along the same track that plane B is flying straight and level. I have no way to quantify how much relative velocity is needed to result in a detectable difference in Doppler shifts. I hope my understanding of this is correct. For any more technical details the experts here need to jump in. From the information we have to date (from Tim) it sounds like the standard error in terms of response time is on the order of 300 microseconds. It also seems that the time is only a one way direction so that would equate to an error of 90 km (for a one way trip or 45 km for a two way trip time). When you say Doppler information do you mean something that Inmarsat can measure in their data stream or Doppler from Radar returns (for the purposes of my response, I am going to assume Radar response? Re: handshake/ping response time errors, visually, another way to say this would be that one “pixel” equals 90 (or 45)km. Tim is probably a better resource for this question but since I don’t see his response yet I will take a crack at trying to articulate a couple of scenarios. (Note, I am not a radar expert, I have a number of years in wireless data experience but I wouldn’t consider myself and expert and I have no specific experience in Satellite comms.) I would say that there are one or two (unlikely) explanations for the fact pattern you have given. Let’s look at the error bar in terms of distance first. (it would be helpful to know the error/resolution for the Doppler calculations) If the Doppler resolution is finer than the ping response time then you could have a single ping response time (within the 0.3ms error) but different Doppler information. Alternatively, if the Radar-measured Doppler information is coming from two aircraft flying in formation, if the radar is sending bursts that are longer than the twice the distance separating the two aircraft see: Figure 2 in this simplified tutorial regarding range resolution. I would expect that if the radar was not very sophisticated then it might get confused by the return and measure a strange Doppler shift that is actually created by two overlapping returns. From what I do know of (marine) radar, the sensitivity can be varied on some (most?) radar stations so if the particular radar sets in question were set at coarse sensitivity (long distance scan mode), then perhaps the Doppler shift would not be calculated correctly? It is hard to go too much further with the scenario you provided (and my limited knowledge). Unfortunately I only saw your post after making my previous post. To draw a circle through the reported position of MH370 at 2:22 I used the 3F1 coordinates N0° E63°51′ that I found on the Web. However, you pointed out that 3F1 was not at those coordinates on 8 March. Would you by any chance know the precise coordinates for that date? I would like to re-plot the 2:22 circle mentioned in my earlier post. Thanks in advance. It looks like you and I were trying to answer Keith at the same time. Your response made me realize that I may have read Keith’s fact pattern wrong but I assumed that he meant that the “ping arcs” were identical for all plotted points for two specific aircraft but the Radar-return based Doppler information was different. I believe that if two aircraft started at the same distance relative to the Inmarsat satellite and flew on certain headings at different speeds, keeping their relative distances from the Satellite the same at all times then the Doppler shift information measured by the Satellite would differ but the arc information would be the same. Example, (I have not worked out the numbers in detail yet) but let’s say the Satellite was directly over the equator (for illustrative purposes) and the two aircraft departed from the same relative distance to the Satellite on a bearing of 90 degrees to the satellite, aircraft A on a heading of 60 degrees and aircraft B on a heading of 90. A would have to travel at a ground speed that is 1/Cos(30 degrees) greater than B in order for the arc distances to match and since their ground speeds would be different, the Doppler measurements at the Satellite would be different. As a follow-up to my earlier post (6:57 PM), I will re-emphasize that the Doppler shift seen by Inmarsat should measure only the relative velocity between the plane and the satellite (the component of velocity in the direction along the line drawn between the satellite and the plane). The groundspeed perpendicular to that line is irrelevant and not measurable by Doppler techniques. Here is another thought. At what times were the two planes interrogated by a Inmarsat handshake? Let’s say Plane A was interrogated at 11 minutes after the hour and Plane B was interrogated at 26 minutes after the hour. The two planes could be flying in formation but the Doppler information (if sufficiently sensitive) could disagree because of some small course correction that took place in the 15 minutes between the two handshakes. The tracks of the two planes would be the same but the Doppler information would differ only because the information was gathered at different times. My previous post with a question to you was daft. I understand from your post that the 8:11, 7:11 … circles would not be concentric because the satellite coordinates vary during one day/orbit, so what I should have asked is: would you happen to know the 3F1 coordinates at 2:22 MYT (18:22 UTC)? MtKlimber pointed out an error in my response. He is correct. It is not ground speed that is important, it is the speed differences relative to the satellite that will result in the different Doppler readings at the satellite. I was using ground speed as an analog but should have used the speed relative to the satellite as my frame of reference. In any event, it is easier for me to think of the satellite as fixed in a position over the earth (even though it is not actually a static point) then think of the projection of the aircraft onto the surface since then I am (almost) working in 2D rather than the 3D trig required to articulate the real physics involved. Thanks for the image from Google Earth with the (much better than my attempts) ping arc “circle”. I had never tried to plot anything directly in Google Earth before and didn’t even attempt to look up how to do what you did until after you posted your image. I thank you kind sir! Happy to oblige. However, I am unsure about the date you gave and the time. Being an astronomer/space scientist, I work in UTC. The following table gives the positions of the satellite (Inmarsat-3F1) at a dozen different times ‘of interest’; I took those from the timeline on Wikipedia. If you need/want others, let me know. For guidance: these positions are all based on using the SGP4 integrator within STK with the latest orbital elements (i.e. equivalent to the old TLEs) used by download via AGI.com, which means via the Center for Space Standards and Innovation (www.centerforspace.com/) and that in turn means the latest unclassified-satellite orbits from what used to be called NORAD. To summarise that: I’m pretty sure they’re correct, but stand to be corrected. I note that various people on this blog have been talking about the possibility of determining a line-of-sight speed for MH370 based on a doppler shift, a matter that timfarrar dealt with in the very first post above (in terms of how a doppler shift measurement might be available in a TDMA system). In that connection I note that the line-of-sight speed of the SATELLITE compared to the surface directly below, due to its orbit being non-circular, is of the order of 3 to 5 kph (kilometres per hour). Obviously it varies between some maximum and zero (at perigee and apogee). For the particular satellite in question the inclination (over 1.6 degrees) leads to a larger speed in the north-south direction than the above speed in the z-direction (vertical) but a value of up to 10 kph is what should be expected, methinks. Obviously the component of that in the line-of-sight to any object (e.g. MH370) depends on the specific geometry at the time in question. Many thanks for replying to my post of 7:19 pm. I refined my question in my later post at 8:00 pm, which unfortunately you missed. Can I be a pain and ask you for the coordinates at 02:22 MYT (18:22 UTC)? Thanks. On a different subject, I’ve noticed that Google Earth and SkyVector give coordinates for the same geographical location. You mentioned in one of your earlier posts that Google Earth is a perfect sphere rather than an oblate spheroid, which I had not noticed. Is there any way to make Google Earth more accurate? Gahh… I should have written “give different coordinates for the same geographical location”. Sorry about the cross-posting. Thanks for the coordinates at 02:22 MYT. I think what you may be asking is subtly different to the question people have tried to answer if all you wanted to know was whether the ping delay would be different for two planes at the same position. The answer to this is yes – the drift within the 325 microseconds could be different. However, the ping timing should change at the same rate and calibration can obviously be made to when the plane was at a known reference location. If your question relates to Doppler in the satellite ping (which would be fascinating since its never been mentioned anywhere in the press as a potential source of additional information), then a similar calibration issue would arise if there is either Doppler pre-correction of the signal on the plane (that is not communicated to the satellite) or if there is a similar frequency calibration drift. It might be less resolvable if a combination of these two factors is in play. I’m afraid I have not gone through the spec I linked to above to understand how Doppler shift impacts the R channel bursts (i.e. the pings). Further to your 6.54pm post, I would note that in combination with my note about the magnetic declination issue, an increasing series of ping arc distances after 2.11am would also be inconsistent with the “zombie plane” hypothesis (an unprogrammed destination due to the pilots being incapacitated) if wreckage is found in the current search area. Because of the increasing declination as the plane traveled south, unless it was traveling to a specific waypoint programming into the FMC, the path would naturally curve towards the southeast and therefore the plane would have had to have headed much more towards the west initially. That would take it closer to the satellite and would mean that the 3.11am ping certainly wouldn’t be further away from the satellite than the 2.11am ping. Again, it would be useful to know what waypoints in the southern ocean might have been programmed into the FMC in the event of the plane being specifically directed to that region. Additionally, as a Chinese spotter plane has now reported ‘white objects’ (42.5453°S –95.1113°E, announced on 24 March by official Xinhua news agency), I have added a placemark for that location. There is a relatively small difference from the plot shown in my post of March 23, 2014 at 6:54 pm, and my conclusions in the aforementioned post still stand. Thanks for this. So I think that even a straight line hypothesis (programmed waypoint-based solution) consistent with the NTSB trajectory is very difficult to reconcile with the 3.11am ping arc being further away from the satellite than the 2.11am ping arc. Note that if 2.11am is the correct time at which the ping took place, then your circle would need to be slightly bigger (because the plane was then further ESE, roughly 150nm from Butterfield). Perhaps you could try and add the NTSB trajectory to this plot (if that is possible) so we can see what that looks like? This includes a graphic showing the movement of the satellite’s location over the surface of the Earth across the time/date in question. I managed to align the lines of longitudes quite well, but the latitude (40°S) shown on the AMSA slide is a bit further south than the corresponding latitude on Google Earth. I just could not get everything to align simultaneously. Still, it gives us a rough idea. I assume the AMSA slide shows a more-accurate globe model (oblate spheroid) than Google Earth’s perfect sphere. It appears the flight path would have had to curve quite significantly. This makes me even more curious to see the unpublished seven satellite handshake arcs for 01:11 to 07:11. The whole southern hypothesis seems more and more bizarre, which makes me think the authorities have corroborating information in addition to the hourly arcs. Four military P3 Orion planes; four non-military jets; the navy supply ship HMAS Success. Two Ilyushin IL-76 planes; warships Kunlunshan, Haikou and Qiandaohu; icebreaker Snow Dragon. 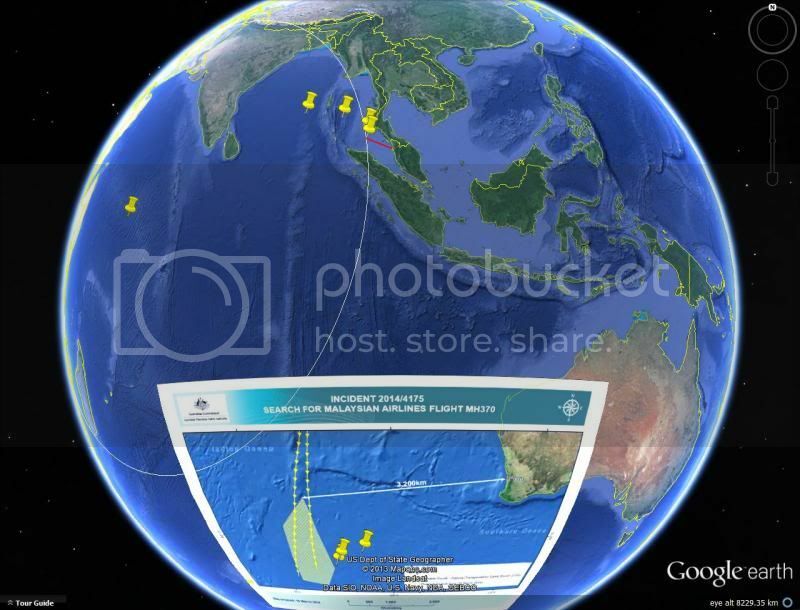 One can rotate the globes, zoom in/out, and click to display the coordinates of a location. The coordinates for three debris sightings (US satellite, Chinese satellite and Chinese spotter plane) are scattered amongst my previous posts, so the anticipated prevailing wind and ocean current at those three locations can be observed using these globes. Thanks. Your articles look very interesting, and I will definitely be reading them to learn more about the general principles, irrespective of the current MH370 search. “This evening I was briefed by representatives from the UK Air Accidents Investigation Branch (AAIB). They informed me that Inmarsat, the UK company that provided the satellite data which indicated the northern and southern corridors, has been performing further calculations on the data. 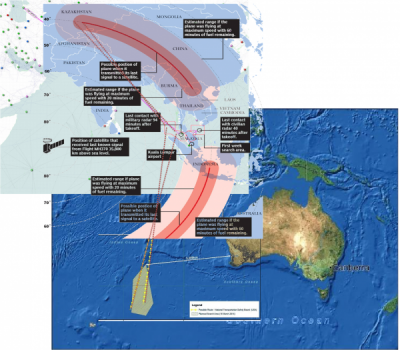 Using a type of analysis never before used in an investigation of this sort, they have been able to shed more light on MH370′s flight path. I was curious to determine if there were any records at the ADS-B tracking sites of Malaysia Airlines flying another of their B772′s as a means of proving Inmarsat’s data, either north or south. 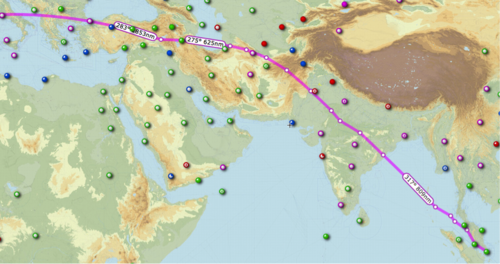 The KL to Dhaka route might have been close enough to the ‘northern arc’; the only southerly routing that looked remotely interesting was a single use of a B772, 9M-MRE, on a KL – Jakarta service on 20th March. Did anyone get sight of all the 9M-MRO handshake timings? The early reports, with any positional data from the last ACARS communication, would be interesting to see how valid the primary radar observations were. Good night all, I guess this chapter is closed (or will be when debris is confirmed). Thanks, I learned a lot. Thanks for posting the PM’s statement. Given how definitive this statement appears to be, I hope the searchers find the “black boxes” and provide some closure to the families. I would hate for there to be another reversal unless of course the reversal revealed good news for the families. Can anyone on this thread shed some light on what this analysis could be (I assume it is related to the Doppler-based frequency shift effect as described by Tim above) but I am puzzled in particular by Tim’s update that indicated that the Doppler correction only occurs in the terminal itself. There must be at least a few critical pieces of information (in addition to the raw data obviously) that is being withheld from the public domain that would explain how the Doppler shift effect would be different for a Southern Route than for a Northern Route. I remain fascinated to learn what the analysis was and how accurate it is. Does anyone have an explanation of the morphing Washing Post article that has been referenced here? It was published originally on March 15 with a graphic depicting just the 8:11 Imarsat tracks showing the northern and southern arcs. There were more than a hundred comments, including several on the main subject of this blog. Then, the WaPost modified the graphic to add several additional pings, and even added references to some of the recent sightings of possible debris. They did not, however, include any statement indicating that they had made changes to the original article. I made a comment criticizing them for not doing so, and shortly thereafter all the previous comments disappeared from the article. I had just happened to save the article including the comments to my local hard drive. My main question is whether anyone has any explanation of why the total Inmarsat data apparently has not been released. It seems pretty clear that the Inmarsat data is what was used to derive the search areas, so why the secret? And if the plots in the WaPost article and other sites is just illustrative, then why don’t they just say so? The 24/7 news channels are finally talking a little about the “new and ground breaking satellite analysis” that has been the subject of this blog for more than a week. Maybe some day someone will explain why it was such a secret. Is anyone else struck by the self-serving comment by the Inmarsat VP “[hopefully] from this, there will be a mandate that all aircraft should be constantly tracked.” The irony is that, if the analysis is correct, then the current system is sufficient to track all aircraft that have a minimum level of Satellite communications with Inmarsat. The other thing that is bothering me (and I suspect I am not alone as @FarmerCharlie seems to be expressing similar concerns in the 2nd paragraph of his most recent post about why the raw data has not been released – redacting of the unique identifiers should be pretty easy) is that I don’t understand how the Doppler frequency shift data and ping ranging data would not be mirrored in some alternate mirror track. If we assume the 2:11 ping (see @Fitzcarraldo Mar 24 4:42AM post above for a graphic) was on a point on a circle, there should exist a Northern mirror path that would generate the same Doppler and distance data. Tim or Keith, can either of you shed any light on possible paths that would only be true for a Southern Route? Another gem from CNN “they haven’t released the pings to us exactly but what we have is pretty close here”. With all due respect, Chad Myers is a weather anchor/reporter. Is he the only person at CNN with any science training (per Wikipedia, BSc in Meterology. Another reference I read on Telegraph’s website was the following: By comparing these models with the trajectory of other aircraft on similar routes, they were able to establish an “extraordinary matching” between Inmarsat’s predicted path to the south and the readings from other planes on that route.. Looking at FlightRadar24, exactly which flight that would have been travelling in the southern possible route were they able to match? To me, it doesn’t look like there is much data to match to in that entire region (the Southern predicted path) while to the North, there are a large number of known flights that could be used to compare to the MH370 Doppler shift info. CNN got it wrong and the Telegraph is much closer. DuncanSteel was on the right track with the satellite movement: the Doppler shift is with respect to the satellite (ie heading away from northern hemisphere planes and towards the Southern Hemisphere ones) not the plane speed itself. It appears they cross checked against Doppler seen from other planes in the Indian Ocean in the last week to prove it beyond doubt. This is what Keith was hinting at over the weekend. The CNN presenters were overcome by their graphical presentation tools, in 2D and 3D. I don’t think they got an explanation across. McLaughlin states that they compared the data to existing B777 flights in the Northern predicted track and could not match the MH370 data (which sounds very much like Keith’s question of yesterday when he asked, “Can you explain TECHNICALLY any scenarios you can think of that would cause a comparison of data between two planes, flying at the same time to result in identical timings yet Doppler information that doesn’t match.” . In light of the McLaughlin interview I now interpret Keith’s question in a different light, McLaughlin clearly states that a number of assumptions were made by the Inmarsat engineers (navigation for autopilot, cruising speed, etc – validated with Boeing but still assumptions for the model) and it sounds like they were trying to make or rule out a Northern Path data match. While that is a fair approach, I do not think it is (as described) sufficient to prove a Southern route. This may be a case of a non-technical person trying to summarize highly technical information. Incidentally, for the last half of the posted interview, McLaughlin essentially makes a pitch for his company’s services and a plea for these services to be mandated by all governments (I happen to agree with him in principle but I think this is in pretty poor taste during this interview). NOTE: I think the Telegraph quote that I referenced in my last post takes McLaughlin’s words out of context when they indicated “extraordinary matching” [to the Southern conjecture]. The way I hear McLaughlin’s explanation, I believe what he said was, “we did not find any matches in the known Northern Route so the Southern Route is the only route that makes sense”. I think this is non-sequitur even if plausible. I hadn’t seen your explanation when I made my post. Your explanation makes sense. I agree that DuncanSteele’s description can be the only differentiation. It still astounds me that they can measure that accurately to measure tiny (relatively speaking) relative movements (~50km : >35,000km) but I guess if their resolution is in the nano-second level for frequency then I guess it is plausible. In any event, I hope the families get the closure they need. To be clear, the 50km reference I used in my calculation above was based on DuncanSteele’s positional data for 3F1 and the largest relative movement by the satellite in an hour ~ 0.5degrees latitude ~50km/hr essentially and perhaps the relevant ratio would be relative to a plane flying at 900km/hr so the delta would be much greater than I first envisioned (the resolution should be based on speed instead of distances ). Thanks to everyone on this thread for their input and clear discussions. Inmarsat-3 F1 has a known ‘wobble’, the GES at Perth is fixed and the aircraft is moving. There are handshakes with the AES at known intervals. According to the spec linked above by Tim, there’s a Direct Verification of the log-on state from the GES to the AES if inactivity on the link exceeds ‘tG6‘ seconds. The Direct Verification initiates a log-on interrogation packet up the P channel which causes that R channel burst in response, the timing datum. So the wobble introduces a series of errors into the RTTs that varies depending on the AES direction of travel. Is that it? The way I interpret it is (from DuncanSteele’s positional information about 3F1) the sat wobbles at a max speed (mostly N-S) of around 50km/hr. The key point is that 3F1 wobbles in a known manner, is not a fixed point in space. Thus, if the AES is (at a distance of (35000-50km)) traveling on a heading of 359.9 (for example) at a cruising speed of 900km/hr and 3F1 is wobbling to the northern most extent of its orbit, then the relative speed (in the N-S axis) is 850km/hr away from 3F1 while a mirror AES (located at (35,000+50km)) is traveling on a heading of 179.9 at a cruising speed of 900km/hr at the same time then the relative speed (again in the N-S axis) is 950km/hr which is a large difference (relative to the difference in relative locations and thus ping response latency). Apologies, my last post probably isn’t very coherent. The ‘ping’ is a component of the Aero-L protocol where the GES attempts to check the ‘log-on’ state of previously logged on but apparently idle AES. The GES determines the AES to be idle if a timer ‘tG6′ expires, tG6 is obviously the hourly period. The GES transmits to the AES over the P channel & receives over the R channel. The initial response burst on the R channel is the timing datum transmitted by the AES +/- 300usec of receiving the incoming frame on the P channel. All very deterministic to give us the range to AES from satellite using the RTT. Now we know the satellite wobbles so the signature of the wobble is embedded in a series of RTTs and the phasing of the signature indicates direction of travel. Is that it? Agreed. I think the key point is that a number of samples are required. So Inmarsat just need to tweak that parameter ‘tG6’ relative to the wobble and they’ve got a new service to sell! Tim (or anyone), can you give a sanity check to my math? Shifted frequency measured at Satellite is ~1.594 GHz. Is the Doppler shift this significant? I was thinking (before I looked up the math) that the difference would be on the order of the channel separation frequency (<35kHz). I think the challenge with measurement of the doppler freq shift with comms to an AES is telemetry. The RTT can be measured & reported at the GES for msgs like the log-on verification whereas capture of the doppler shift in the L-Band leg, sat to AES, would have to be onboard the satellite itself (up/downlink to the GES is in the C-Band). Just joining the conversation. I’m a retired US Federal R&D engineer who worked for a law enforcement agency for about twenty years. Had some responsibility in aircraft modification. Spent a lot of time in asset tracking, geo-location, and cellular systems. Managed the development of a radar-based aircraft command and control system. Was awarded a patent in cellular system mobile device location techniques. This lost aircraft situation makes no sense to me. At a very high level I am astounded that Inmarsat has not released its raw data so posters on this blog and others can provide an independent review and analysis. However, my other problem with the data supposedly released by Inmarsat is that these radial arcs are presented as single lines. o What timing base is available to the Aircraft Satellite Terminal – and the rest of the system? Does this Terminal have an integrated GPS receiver? What is the most accurate measurement that can result from this this Terminal? Or, more appropriately, from whatever system is used to calculate the radial distance? What is the lease accurate, which is the weak link in the chain? o How does all of this affect the doppler calculation? o Why is all of the raw data be held closely? I had to take a land surveying course as a freshman. It seems that all we talked about for the first month was measurement error and how we induced it. While discussing radar accuracy during the development of our command and control system a retired FAA engineer told us that FAA separated aircraft by two ‘range cells.’ A range cell was 1/4 mile long. So much for exquisite accuracy. The fact that raw data are being held closely bothers me. Maybe it’s because everything is proprietary. Maybe it’s because someone is slicing the baloney pretty thin. Maybe it’s somewhere in the middle. I’m really trying to move past all this and accept Chris and team at face value today – especially after his “thank you” to me on live air… but I’m struggling as I have yet to see any hard data (they’ve just shared summaries to me). I think I understand the science behind all of this but I’m going to ask the question anyway. Two planes, one traveling slightly above or below the other. Both transmitting to the same satellite. Same timing and same doppler shift? Any possibility that having another plane so close would distort or modify the doppler for one plane and not the other? Trying to see if there is any possibility that the data they were working with could be skewed or false if MH370 was shadowing another plane. You will never know the answer to your question until Inmarsat releases all of their raw data. There are just too many unknowns and we’re all guessing at the solution of what amounts to a multivariate equation. >Does INMARSAT look for a “transceiver specific” identifier code like a computer MAC address? Was the single ACARS message sent (1) via radio-to-ground or (2) via satellite, or do we know? The ACARS message is important because it tries to “confirm” the fuel on-board. Is it possible to use a laptop to simulate an ACARS message for the purpose of sending one (fabricated) status report? Is it possible to produce the apparent southerly track by flying slower on a curved track that veers toward Australia? >I’m pretty sure the answer is yes provided a sufficient speed (e.g., 350 knots) can be achieved. >As a minimum, you need to be able to get from the 7:11 arc to the 8:11 arc in one hour. >What if the plane being tracked was not MH370 but rather a small business jet, and the pilot was not dead? >A lot of small jets have INMARSAT equipment installed. Is it possible to turn off the INMARSAT transceiver on-board MH370 whenever desired if you know where the circuit breaker or fuse is? Is it possible for a 777 to shadow a 747 (Cathay Pacific Airlines Flight CPA/CX749 – Departing Hong Kong between 0005 and 0020 en-route to Johannesburg) over mostly open water (which flies 250 miles from India and 500 miles from Diego Garcia … out of military radar range)? > Try and take a look at around 7:30 PM EST, 4:30 PM PST, 2300 UTC. What is the maximum range of a 777-200ER at normal cruise altitude and speed? What is the maximum flight time of a 777-200ER at normal cruise altitude and speed? Can range be significantly increased if the plane adjusts speed based upon flight conditions for best miles per pound of fuel? If MH370 crashed at the southern Indian Ocean site, how far did it fly at normal cruise altitude and speed? How do we KNOW how much fuel was on-board MH370? What would it take to “FOOL US” about the fuel load? What are the two most uninhabited regions where someone might want to “land” MH370? If MH370 had a full load of fuel, could it have flown the initial evasive course, gone south toward the southern crash site, turned at the 8:11 ping, and still have made it undetected to southern Somalia? How could you hide a Boeing 777? Was this a “trial run” for a subsequent “for real” attempt? Because of the possible consequences of not getting this right, the above questions … which have not been answered … are presented. Hi everyone: Again, this has been a really useful discussion with lots of good input. As several people have written: if Inmarsat would only release its values for the ping time delays then we might be able to verify the statements made (e.g. by the Malaysian PM a short while ago). 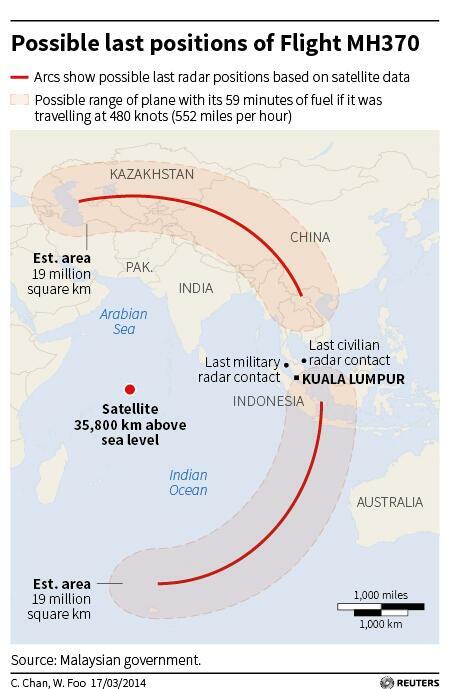 As things stand, the only real evidence I have from Inmarsat is the infamous ‘red arcs’ and rings graphic/map as released on (I think) March 15 by the Malaysian Government. Because that graphic is WRONG – it shows the satellite above the equator – I must assume that all Inmarsat analyses are also wrong for the same reason, unless I have access to some actual data (the time delays) which I could then verify by inserting them into my STK simulation and plotting out the equivalent rings/arcs, using the correct satellite positions at each ping time, the true geometry of the Earth, an assumed airplane altitude, and so on. Thanks to the various people who have commented kindly on my posts on my website (duncansteel.com). In the preceding comments some have taken the satellite ‘drift speed’ (i.e. its actual motion compared to a true geostationary point) to be up to 50 kph in a mainly N-S direction. I think I wrote 10 (ten) kph, not 50 (fifty) kph previously. However, I will take a look into this to verify what the actual drift speeds were across the times of interest, and also the line-of-sight speeds to the airplane (a range of values, obviously), for the use of those people considering doppler shifts (which I have not: my analysis is based solely on the ping time delays). You are right, the velocity of the wave front is the speed of light, not the velocity of the aircraft. I am happy to note that my instincts are still reasonably good since I thought the result I got could not be correct. I can’t remember where I read it but I understood that Inmarsat measurement accuracy for frequency was on the order of nanoseconds so a 1.5kHz shift would be easily detectable if any additional error introduced was reasonably small. Duncan Steel – sorry about the inadvertent name change. I used your data with a fair amount of “artistic license” to perform an order of magnitude analysis. I just looked at the lat and long points you posted with the times and the distance that would represent them assumed a max speed at midpoint. From an order of magnitude perspective, 10 kph vs 50 kph is not that large. I too took a land survey course way back when and my favorite expression that described the discipline was ‘measure with a micrometer, mark with chalk, cut with an axe’ – right or wrong, I try to avoid measuring with a micrometer for a first sanity check. 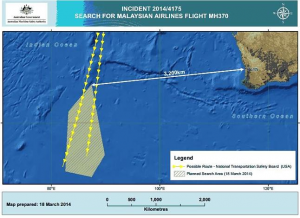 “On March 19, Malaysia Airlines told SITA to use the AAIB as the main analyst of the Inmarsat data. The AAIB, part of the Department for Transport, passed on its own interpretation to Malaysia, but it was not until Sunday, March 23 that a further calculation by Inmarsat convinced the Malaysians of the aircraft’s whereabouts. 1. How many responses does the AES send? Does it receive the request and send one response? Two responses? More? Let’s assume that two or three are sent. These are very short bursts that probably do not, in aggregate, take one second. If I have this upside down will someone please correct me? Let’s recast Keith’s question to something like, “If two aircraft are flying in close proximity along the same or similar range arcs could one aircraft demonstrate doppler data different from the other for a period of one or two data bursts every hour?” My response is ‘why not?’ Especially if one of the aircraft is making occasional course/speed corrections to stay at some predetermined position relative to the other. Regardless of these arcs’ accuracy the aircraft are, by definition, on that arc (actually a band). And, if one of the aircraft jogs (relatively) towards or away from the satellite the receiver will see a doppler shift. Remember, the doppler shift is only telling you that the aircraft is moving radially towards or away from the satellite – not whether the aircraft is in the northern or southern hemisphere. To my mind this is slicing the baloney pretty thin. 2. What magnitude of radial velocities are Inmarsat reporting? Could these velocities also be explained by an apparent velocity change caused by an impulse? To further answer Keith’s question… What is the probability that either of these (southern vs. northern) solutions is correct? Probably about fifty-fifty. Especially with the dearth of real information we’re stuck with. Publish the raw data and give us all a chance to chew on it. The answer to Keith’s question may be NO, but it may also be the wrong question altogether. The Excel? graph from Inmarsat shows that the pings were not always hourly. So the first question about SQ68 should be whether it had the same ping schedule as MH370. Those chances, in my mind, are low. Once the schedules are different, the wobble would mean different dopplers. The assumption by Jeff Wise about the 2:11 ping radius, I believe, is not solid. He quoted Inmarsat as saying the “timings got longer.” It’s not clear whether this is referring to a time shift or a frequency shift. Consider that a later ping could be closer to the subsatellite position, yet receding from it. Correct me if I’m wrong, please, but this could easily allow the plane to have been a bit closer to the subsatellite position, supporting either Keith’s route OR the avoidance-of-Indonesia route. The real issue here is that we need ping times, frequencies, and distances. It looks like the satellite location is known to y’all, which is huge. I understand that the ping transmission from the aircraft did not include any content not even a timestamp. Therefore how can the transmission time be accurately determined? The burst time offset would seem to require precisely fixed times of transmission by the aircraft, which in turn would seem to require a very precise clock onboard the aircraft, essentially an atomic clock– not so? Moreover the clock would have to be synchronized with the satellite clock — how is that done? Also I thought the satellite initiated the handshake by sending the first transmission to the plane, and the plane replies. That gives an RTT, however, what is the time between receipt of the transmission by the plane and transmission of the return? If this is a known fixed interval, then the transmission time from satellite to plane (from which distance can be determined after correction for relativity etc.) is the time onboard the satellite from transmission to receipt of return signal less the fixed interval. But that would also require a very accurate clock onboard the aircraft. I have no expertise in this and have been unable to find a solution online. Any technical information would be greatly appreciated. Thank you. Your questions are indicative of what a lot of us have been grousing about – a complete lack of raw information. If all of the parties involved simply published a file of the raw data and included a detailed specification of the equipment on the aircraft, the satellite, and the earth station (aka the ‘system’) we’d all have an opportunity to analyze things to our hearts’ content. The reason that there are divergent solutions to this problem is that we are all essentially trying to define a curve using only one point. This results in having a whole series of possible solutions that all have the same probability of being correct. Why?? Regarding timing, you are correct. It is simply impossible to calculate an accurate distance without having an accurate timing base. If all of the components in the ‘system’ had a GPS receiver an accurate time base would be available. However, the system would had to have been designed to use that information. I seriously doubt that it was. The Inmarsat satellite was launched in April of 1996. That probably means the satellite’s technology dates from 1995 or before. So what does that mean? How accurate is that satellite’s time base? I think you folk are missing one single point. On 29 April Malaysian officials in Beijing told relatives that “nearly 20 minutes” after last voice contact with MH370 (@17:19 UTC) military radar from Butterworth spotted MH370 west of Penang. 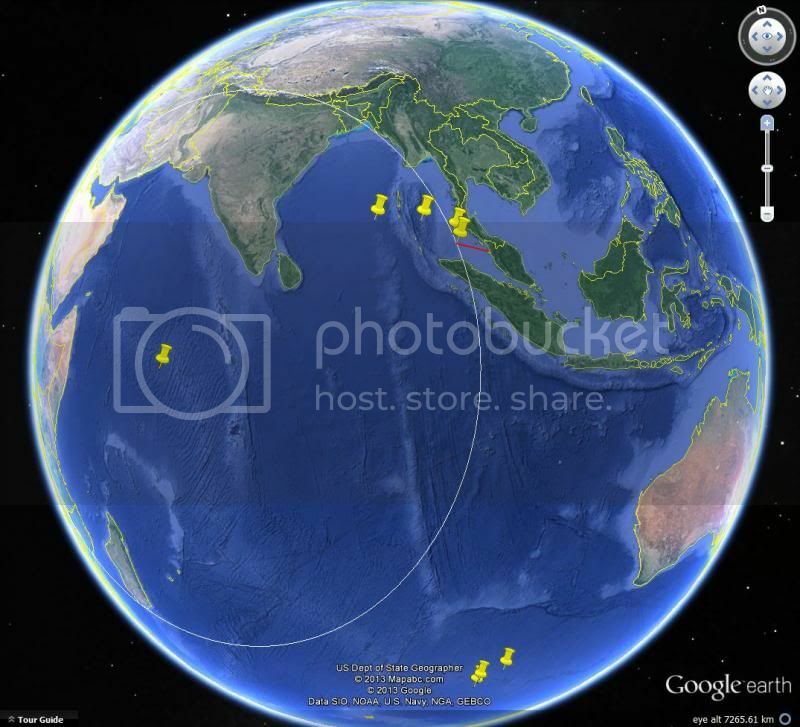 The communication Company SITA continued tracking MH370′s transponder flying northeast until 17:27 UTC. 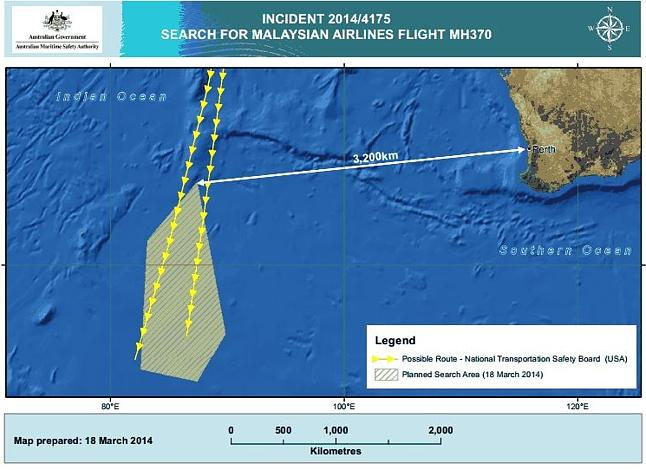 At 17:24 UTC MH370 was located at 006.93′N, 103.59′E. The distance from that location back to the west coast of Penang is 250nm. Has anyone ever bothered to consider how long it would take to fly this distance? If as Malaysia tells us MH370 descended to 5,000ft to evade radar then airspeed would have been limited to just 250kt. The time required to fly 250nm back to Penang would then have required an hour. Even flying at 35,000ft MH370 could not have reached Penang in nearly 20 minutes. At 35,000ft it would have been spotted by military radar at Kuantan, but it wasn’t …. because MH370 never flew west.